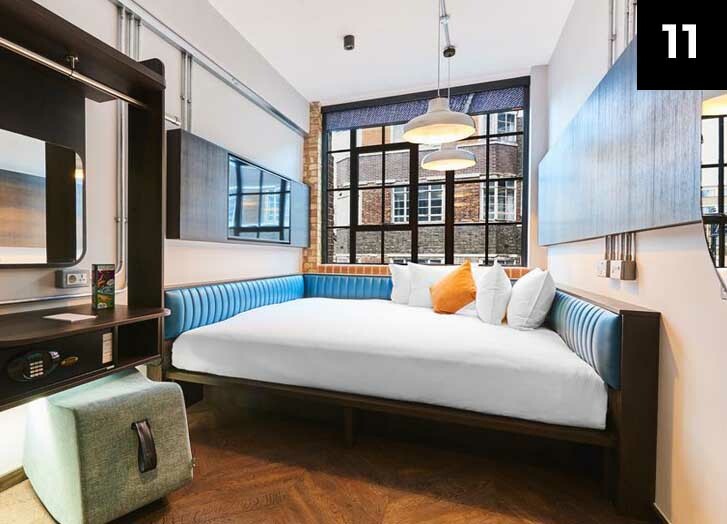 In the race for luxury in tier two cities around the United Kingdom, Cambridge city centre’s lack of statement hotels doesn’t exactly rank it highly among others. Despite the city being riddled in history and context, substandard independents remain firm, not willing to set themselves aside from others in regards to design. 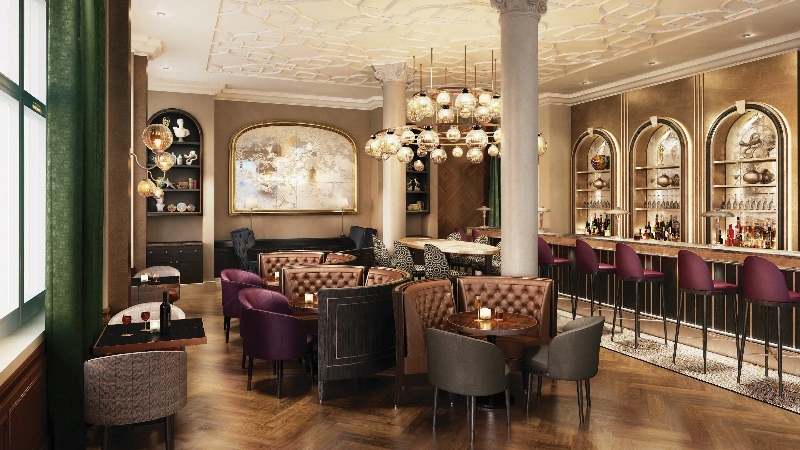 But amidst the unimaginative and limited hotel scene, things are changing and there is one property in particular that is shaking up the competition to become one of the UK’s best luxury hotels. Cue the monumental unveiling of University Arms, Cambridge. 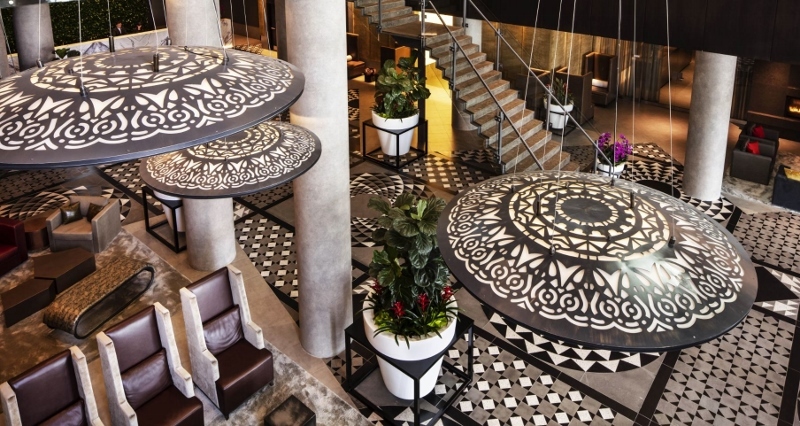 While the hotel’s shell was on the boards, Brudnizki and his team took the mass of inspiration from the history and culture around the city and infused it into thoughtfully curated interiors. “I always knew we wanted to create a hotel that reflected the academic heritage of Cambridge, whilst also feeling fun and approachable,” added Brudnizki. “The hotel is in the perfect location for university parents to stay at when visiting children or for those visiting the city for a weekend break. With this in mind, we created a hotel that combined academic references – the tie-patterned carpets, suites named after famous academics and the restaurant that feels like a college dining room – with comfort and elegance. Guests now enter the hotel through an extravagant Porte Cochere entrance. 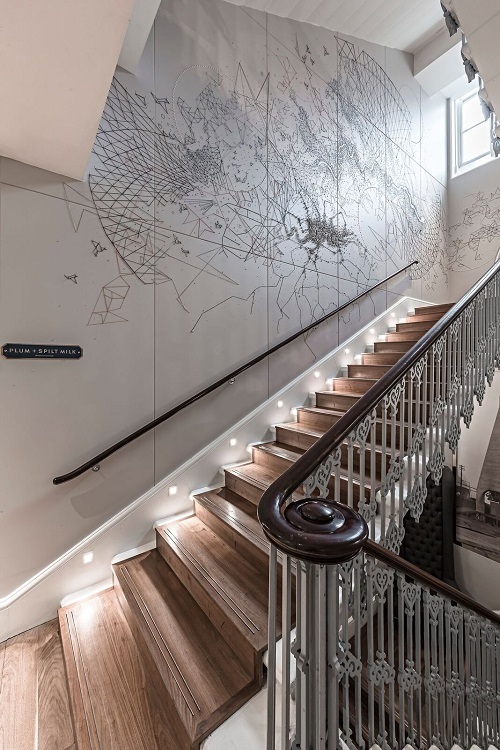 “This element of the design references the scale style of the neighbouring Downing College, highlighting the historic association the hotel always had with the university,” Simpson added. The large lobby is complete with two striking chandeliers that hang above both the minimalist check-in area and the concierge desk. 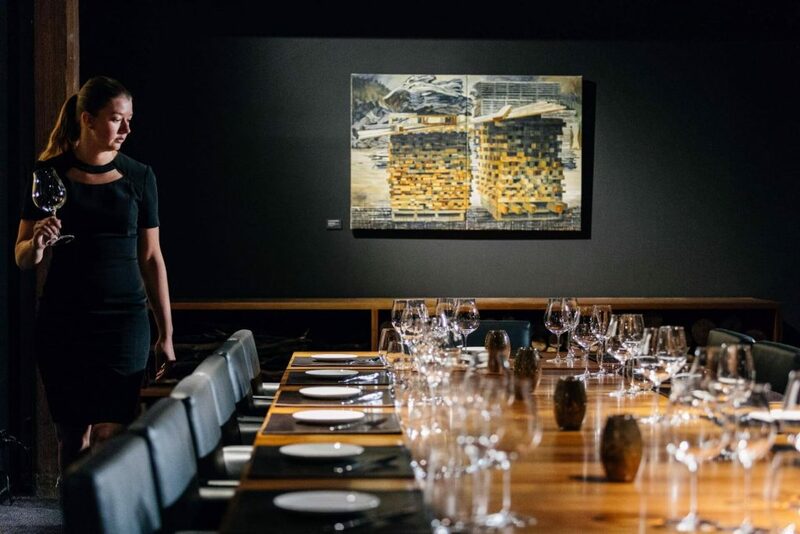 On the walls, art curated by Adam Ellis hangs on chains and has been inspired by Cambridge’s roots, its past heroes and heroines and its many eras of charm. A poster-style piece “The Man in the White Suit” next to the lifts suggest that this hotel has been designed by and for the modern traveller to enjoy. In all the rooms, which come in four categories, attention to detail is immediately evident. The ‘do not disturb’ signs are shaped as bookmarks, while the writing desks – think ink quill and paper rather than emails – were inspired by the traditional student desks that are finished with coloured leather tops. 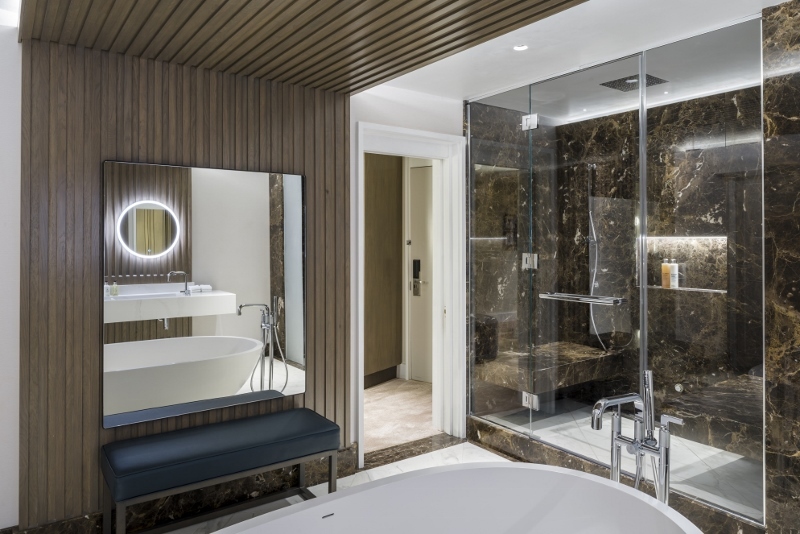 The bathrooms in the suites, complete with underfloor heating, are both stylish and lavish. Victoria + Albert baths positioned by the windows, accented with gold legs, create an immediate statement – as do the gold shower fittings from Vado. The walls, meanwhile, have been painted in the same light blue that is associated with the city, keeping the interiors balanced and tame in all the right places. The public areas overlook Parker’s Piece, a large plot of grass that is rumoured to have been where the rules of Football Association emerged from (probably over gin and tonics). The library, which, when pushed, Brudnizki admits to being his favourite area of the hotel, is a clever blend of indoor/outdoor interiors, designed to be light, bright and open for all. 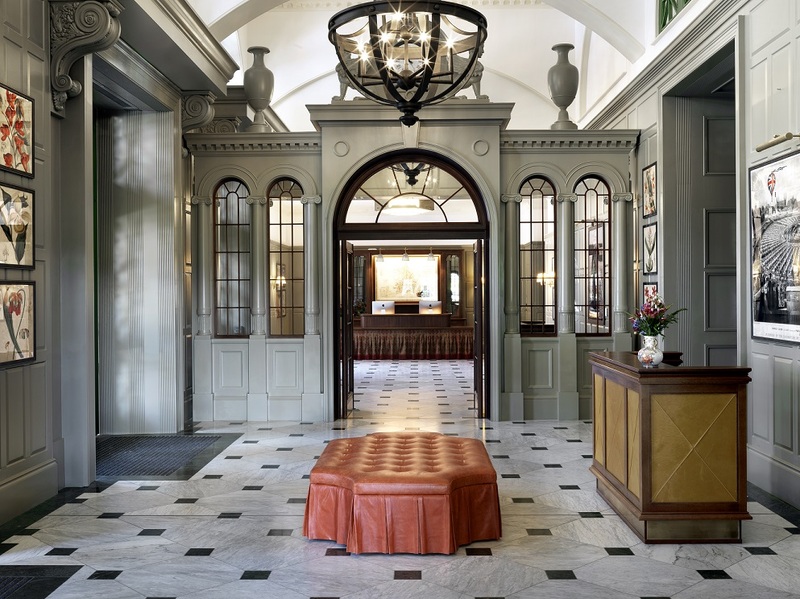 It’s refreshing to see an upscale hotel in Cambridge bravely achieve what no other hotel in the area has managed to; take on the history and heritage of the city and seamlessly blending into the architecture and the fabrics. 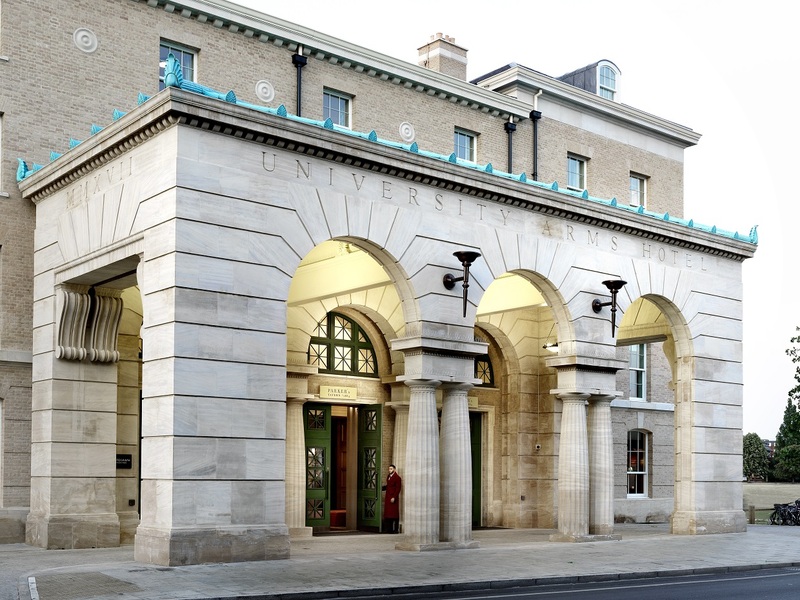 Through true collaboration between MBDS and John Simpson Architects – both of which were winners at The Brit list 2018 in their categories – University Arms is now a timeless gem, in a league of its own operating in a modern city with a storied past. 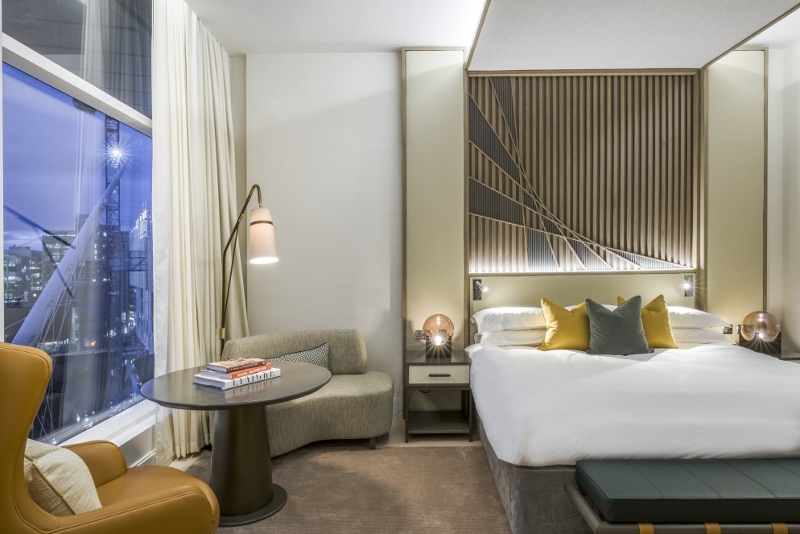 Amidst the increase in luxury hotel development in Manchester, The Lowry Hotel is upping the ‘luxury stakes’ once again by unveiling the first look at its newly renovated Presidential Suite, designed by Goddard Littlefair and the largest both currently available or planned in the city. 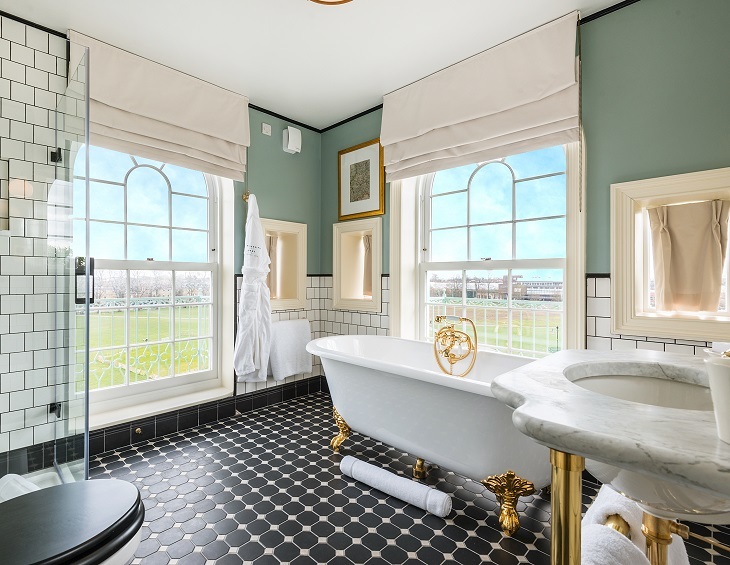 The renovations totalled £700,000 and include a complete reconfiguration and redesign of the space, an enlarged dressing room and a new bespoke marble bathroom. The suite also includes a fully equipped kitchen, large bathroom with a double steam shower and free-standing bath, super king size bedroom, a walk-in dressing room and lounge plus a dining room for up to eight people. There is also an additional second bedroom and with adjoining bathroom. The floor-to-ceiling windows offer views across the river Irwell and Manchester’s skyline, and the room also comes with a mini grand piano, two in-room bars, two smart TVs and an Amazon Alexa. 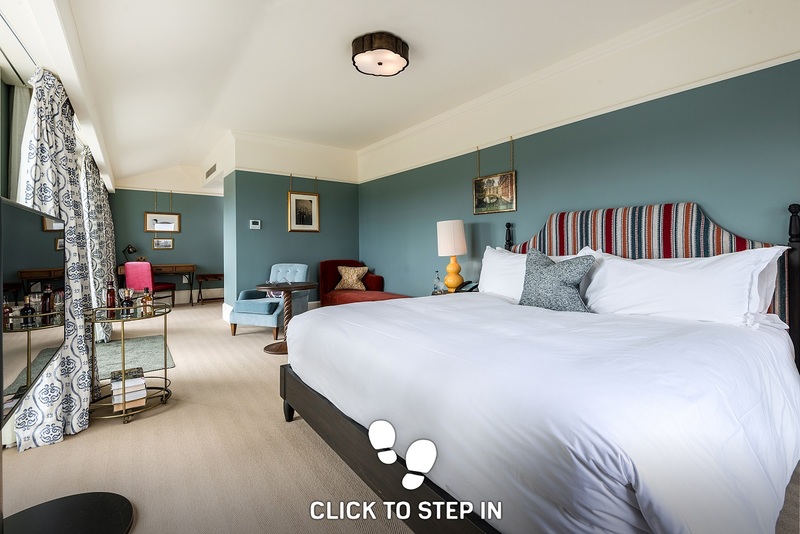 As well as complimentary valet, luggage management, personalised welcome drinks and in-suite check in, guests can take advantage of a butler, on-site hairdresser, endless beauty treatments, Tesla hire, private chef or personal trainer whilst staying in the luxury suite. 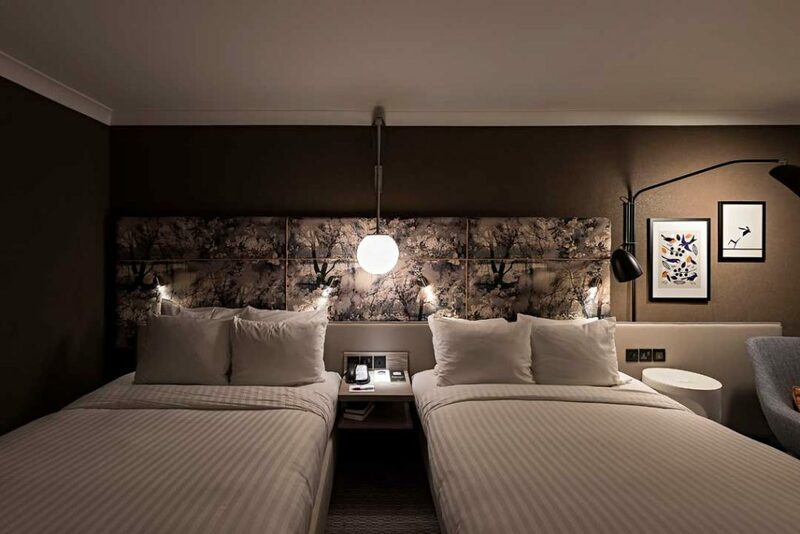 Renowned interior designers Goddard Littlefair, Interior Designers of the suite, commented on the inspiration behind the design: “‘This was a special and prestigious project for us, showcasing the first of our new designs for The Lowry Hotel. We drew inspiration from Manchester’s industrial history and in particular from cotton, weaving and the city’s industrial forms, geometry and heritage, including the shape of Trinity Bridge over the River Irwell, directly outside the hotel. We were also inspired by Lowry’s own colour palette, as the artist famously kept to a base palette of only five colours, mixing them to achieve tonal shades that nonetheless stayed within a distinctive overall range. “The new design has a residential feel, with light and bright tonal colours used for the walls, curtains and carpets, offset by darker joinery, geometric-patterned fabrics used for cushions and curtain trims for added visual interest. Colours range from rich bronzes and burnt oranges to off-whites and textured blue-greys. 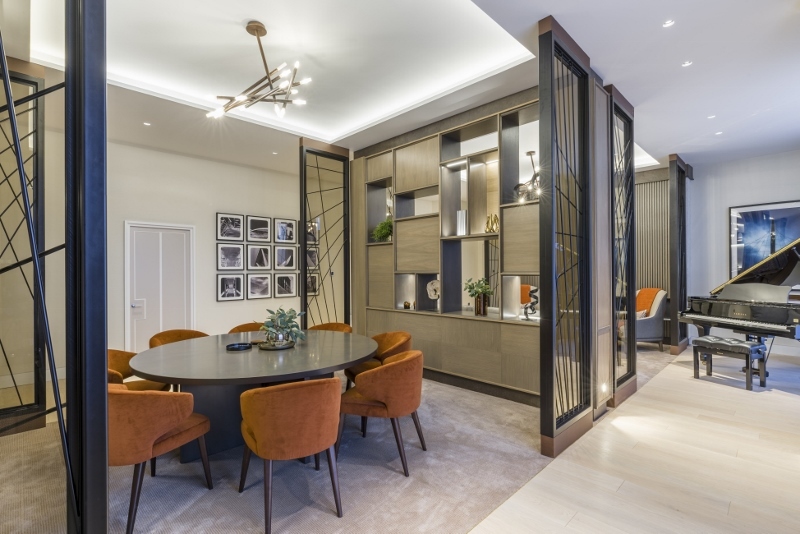 Special joinery features include four sets of double screens around the living and dining areas to help zone the space and a bespoke dining table for eight with a feature veneer inset pattern. 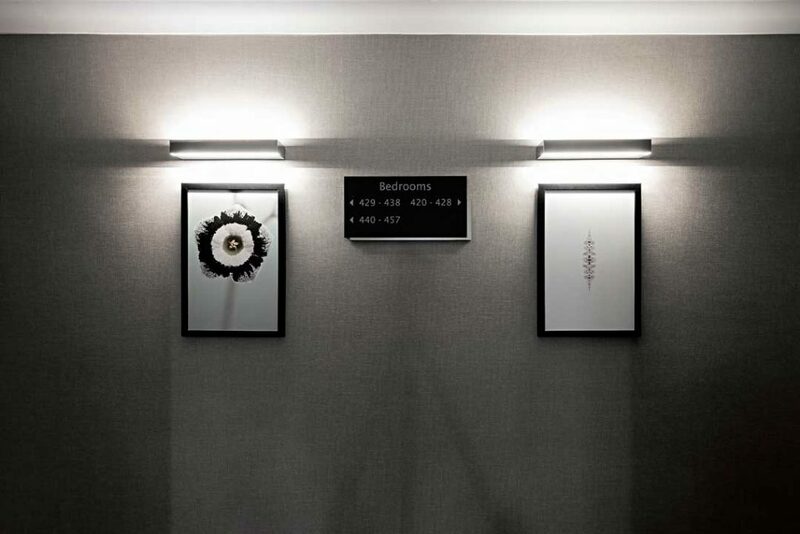 In homage to the hotel’s namesake, L.S Lowry, a selection of art has also been chosen for the room by ARTIQ. 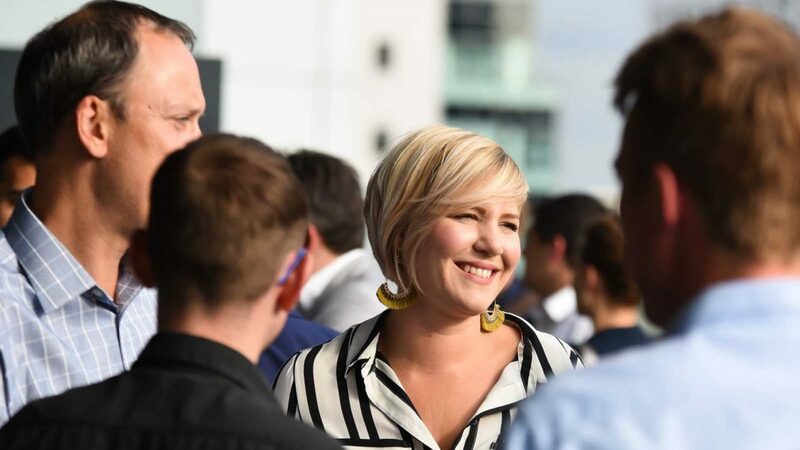 Kate Terres, Head of Operations at ARTIQ, commented: “The collection at the Lowry presented an exciting opportunity for us, because it is rare for hotels to be named after celebrated artists. In curating the collection with Goddard Littlefair, ARTIQ pulled specifically on L.S. Lowry’s recognisable palette of charcoals and dark reds against pale smoky backdrops. Alongside these distinctive tonal elements, the curation draws on the shapes evoked by Manchester’s solid industrial architecture of the twentieth and twenty-first century – examples of which can be viewed from the Presidential Suite – as well as heavily abstracted figures that draw on Lowry’s matchstick figures. The luxury Lowry Hotel also boasts six Riverside suites, an additional 164 guestrooms, a spa, bar and The River Restaurant. 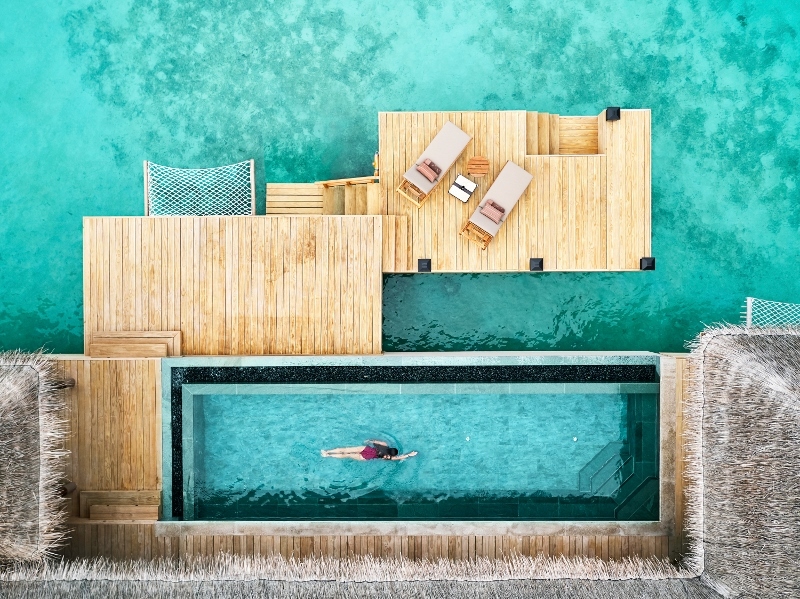 Conceived as an immersive island retreat, Joali Maldives has opened with an array of original, experiential works of art and dynamic design, reflecting the beauty of nature, and with sustainability at their core. Situated on the idyllic isle of Muravandhoo in the remote Raa Atoll, just 45 minutes by seaplane from Male, the unspoilt island celebrates the creativity of world-class talent. Dotted around the resort, adorning villas and hidden beneath the waves are a collection of extraordinary works by 13 international artists, hand-picked by curators and concept developers of No LaB; Ala Onur and Zeynep Ercan. From sculptures to design and experiential pieces, No LaB has chosen pieces which capture and conserve nature both visually and materially. 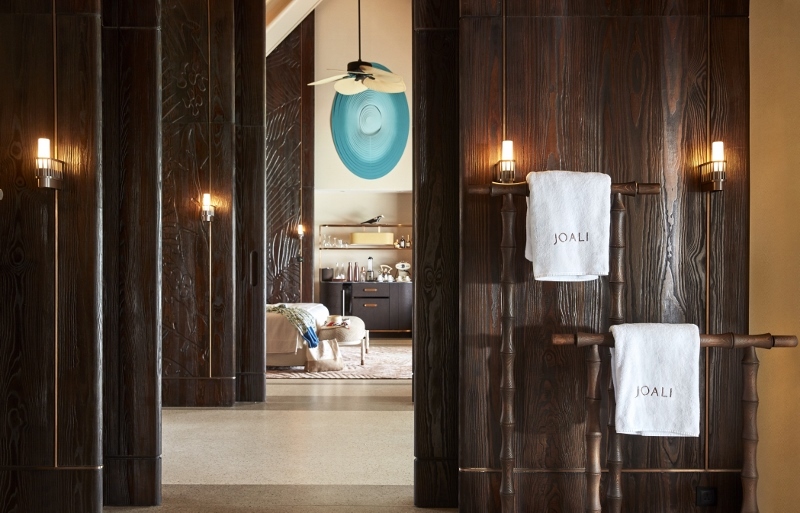 Each artwork is thoughtfully integrated into their natural surroundings: some pieces were created by artists on-site, other creative concepts were adapted for Joali’s tropical climate. Joali will continue to curate surprising interactive art experiences, with new pieces added throughout the year. An annual art calendar will host a roster of workshops and residencies with visiting artists, designed to inspire, inform and enchant. Joali’s impressive roster of artworks are integrated with impeccable design and architectural skill by acclaimed Istanbul-based Autoban, whose other projects include House Hotels Istanbul and London’s Duck and Rice. The firm used custom-made furnishings, hand-carved wooden panels, local wood, bamboo and terrazzo flooring to create the ultimate sense of jungle chic. In designing the resort, Autoban worked to preserve the natural flora of the island as much as possible, saving more than 1,000 palm trees in the process. On arrival, guests are wowed by an impressive Manta Ray-shaped welcome jetty complete with undulating Maldivian thatched roof crafted by Istanbul’s Atölye4n, while Tokyo-based Studio Glitt are behind standout Japanese restaurant SAOKE, with its majestic pyramid roof made up of timber blocks like origami, with clean lines and soft lighting reflecting Japanese aesthetics. 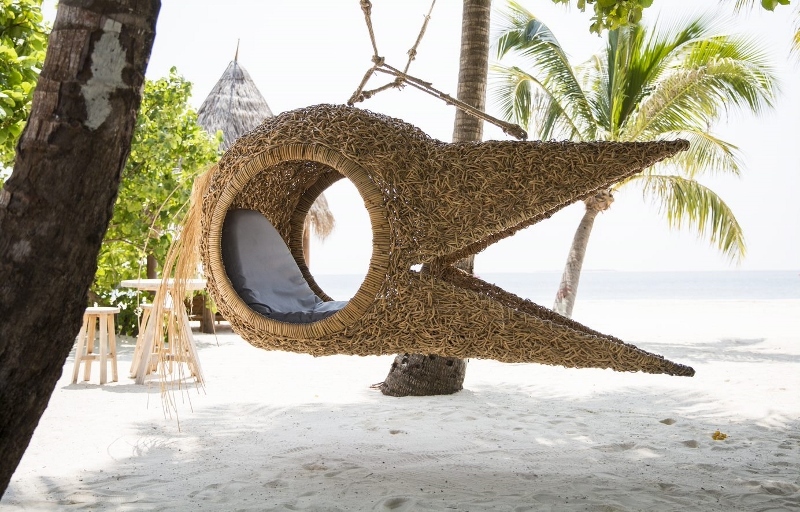 Vernacular architect Porky Hefer, who recently partnered with the Leonardo DiCaprio Foundation at Art Basel, displays his signature passion for local wildlife and endangered species, with his hanging ‘Heron’ chairs, which overlook the beach. The grey heron is the national bird of the Maldives and Joali’s signature, spirit animal. 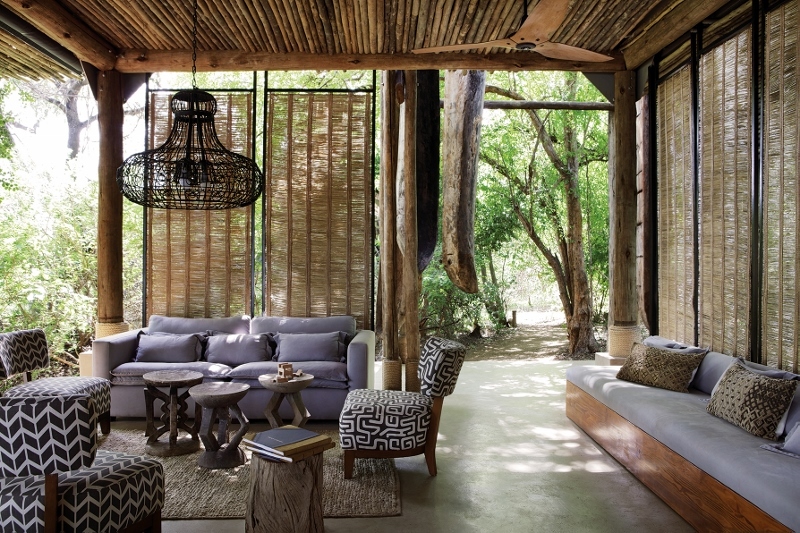 Hefer’s astonishing Manta Ray hideaway, woven in-situ from natural materials (WHAT) is suspended in the trees, experiential dinners in the treetops. His imaginative, nature-inspired works are designed for functionality as well as style, and have a message of conservation. 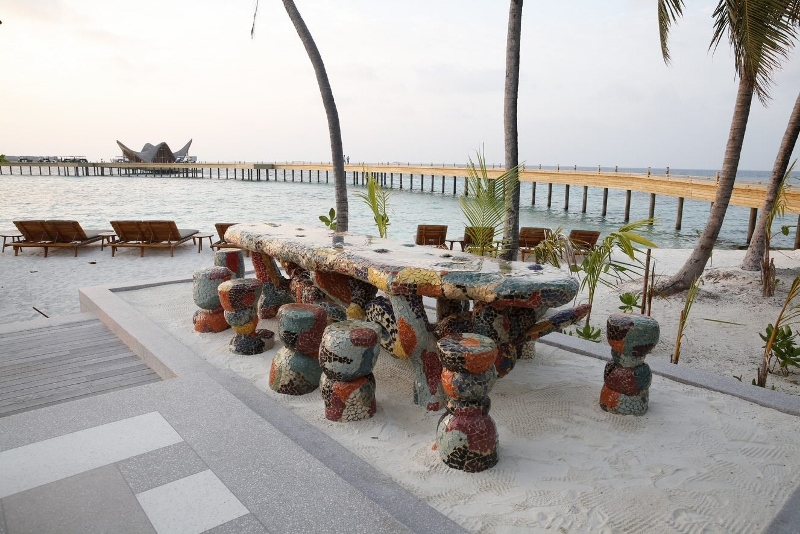 Renowned for his sculptures which use unconventional materials, including recycled rubbish, bronze and glue, at Joali, Kahn has created an underwater sculpture garden using a combination of vibrant-coloured and pale mosaic tiles to reflect the coral bleaching occurring in the Indian Ocean. Visitors to the island will be able to snorkel or dive to interact with this piece, and coral itself will gradually attach as part of the regeneration of the reef. Above land, Kahn’s Gaudi-esque communal table, which echos the shapes of the underwater pieces, is the perfect spot for sunset drinks and experiential dining experiences overlooking the beach. 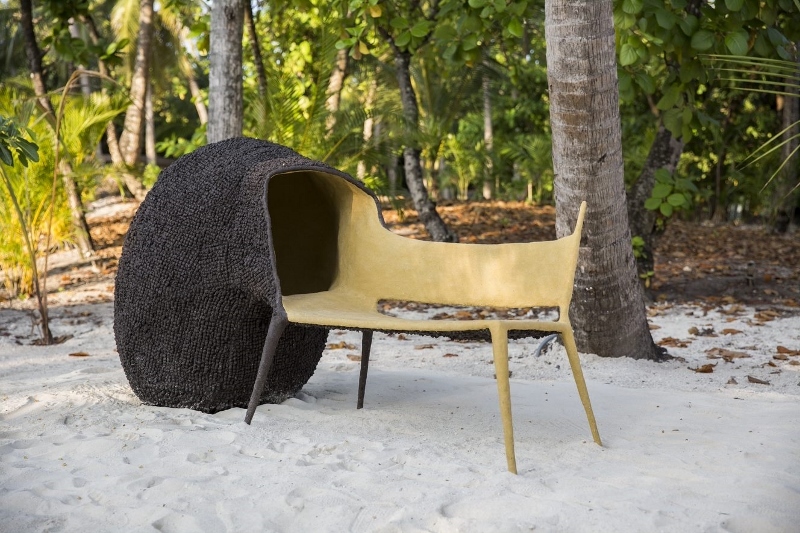 Recreated especially for Joali with materials like sand and tree sap, Nacho Carbonell’s iconic Evolution chair has been adapted for the tropical climate. The cocoon-like chair offers a private moment of quiet introspection to anyone seated inside its depths. On the wall of each villa, an eye-catching clam-like centrepiece by Seckin Pirim have a ripple shape reminiscent of the aquamarine waters surrounding the island. Pirim’s installations are a reflection on his childhood memories and pick up on the varied tones of brilliant sea blue around Joali. 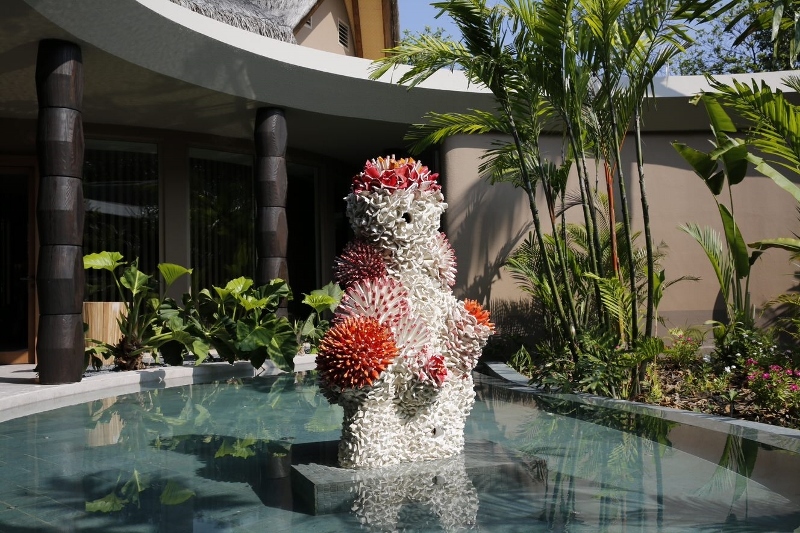 Inspired by the Maldives’ rich underwater world and appearing in Joali Spa, this dramatic sculpture comments on the issue of coral bleaching affecting the region, with striking bursts of colour against a stark white backing reflecting a hope for future regeneration. 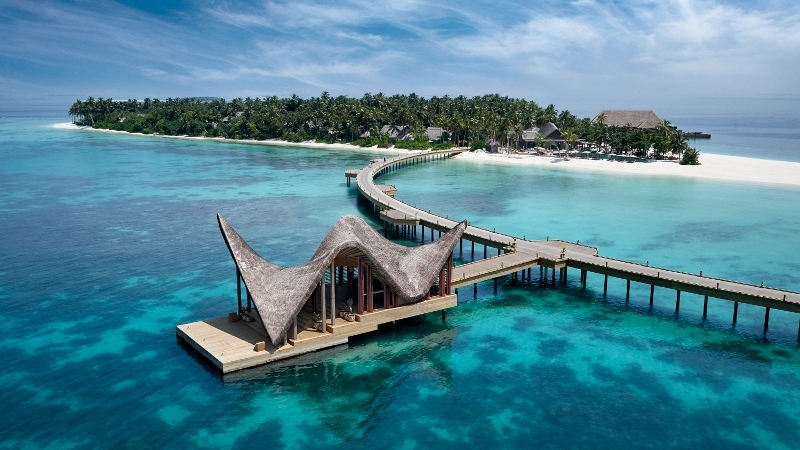 The hotel, which opened in December 2018 on the island of Muravandhoo, embodies the joys of life in its focus on art, wellbeing and sustainable luxury, with a boutique feel to its 73 beach and over water villas. Autograph Collection Hotels, Marriott International’s distinctive collection of passionately independent hotels, has revealed the latest addition to its portfolio with the reopening of Hotel Elephant Weimar following a nine month full renovation. The boutique hotel offers 99 guestrooms, all of which have been redesigned to capture the spirit of the property’s artistic and architectural heritage. Three elegant and spacious suites are named after art, literature and architectural luminaries that have previously stayed as guests, including Lyonel Feininger, Thomas Mann and Walter Gropius. The unique design is a result of the creative collaboration of Bost Interior Design and DK Architekten, which draws upon 1920s elegance fused with an eclectic mix of iconic German structural design and modern flourishes. Taking inspiration from Germany’s leading literary figure, Goethe and his Theory of Colours, the colour palette throughout the property consists of rich, natural tones of grey, blue and dark emerald. While a thoughtfully curated collection of contemporary artwork adorns the hotel walls, the hotel is especially proud to be exhibiting works from leading German artists Georg Baselitz and Elvira Bach. Celebrated for its artistic and cultural heritage, the historic hotel remains the ultimate hub for city explorers and is situated a stone’s throw from the very best that Weimar has to offer. With 19 of the city’s sites listed in UNESCO’s World Heritage list and an array of cultural hotspots including the Classical Weimar ensemble, Herzogin Anna Amalia Library and the Memory of the World, guests can enlist the hotel’s in-house cultural concierge to make the most of their trip. The culinary highlight of the hotel is Restaurant AnnA, specialising in local, authentic cuisine in a stylish and contemporary setting. The Lichtsaal room, meanwhile, is situated at the heart of the hotel offering a cultural hub for guests and local residents to meet and enjoy the properties unique art collection as well as a curated programme concerts, readings and plays. A state-of-the-art sauna and fitness area will also be opening in February 2019. For meetings and events, the hotel provides 560m² of spacious and adaptable event and banquet space, accommodating up to 100 guests per room. Three unique meeting rooms filled with natural light are available to book, equipped with high-quality conference technology. 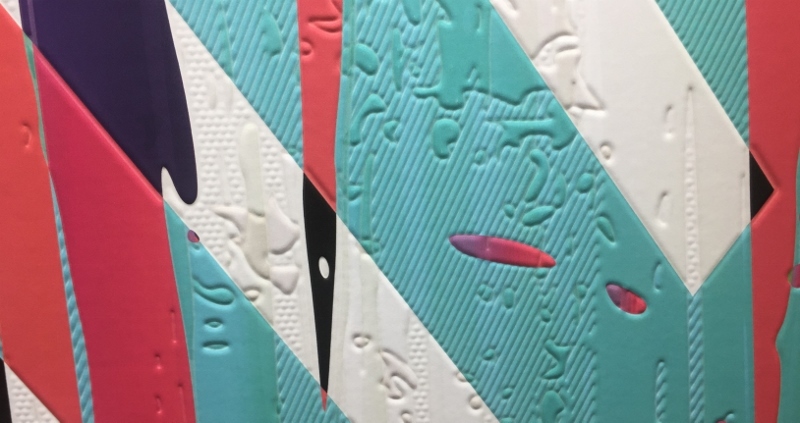 LIFEWTR® and Marriott Hotels have collaborated with the aim to bring more inspiration into the world through art and innovation, via new augmented reality (AR) in-room guest experience. As part of PepsiCo and Marriott International’s recent partnership renewal, LIFEWTR, the premium bottled water that exists to advance and showcase sources of art and creativity, is now the official in-room water for Marriott Hotels nationwide, encouraging guests to explore new worlds of creativity and inspiration within their Marriott Hotels guestroom. LIFEWTR and Marriott Hotels marry art and technology through a unique experience, where guests are encouraged to browse virtual artwork from LIFEWTR artists and transform the walls of their guest room according to their inspiration. The AR experience will be rolled out for guests in Marriott Hotels in the US throughout 2019. 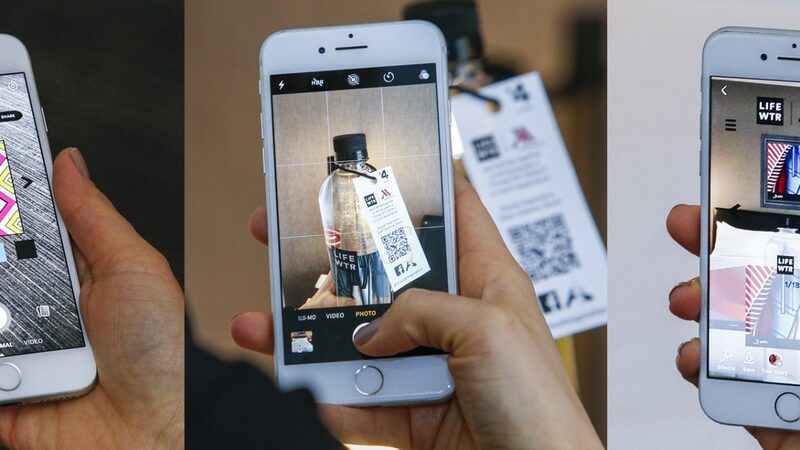 Once the code found on bottle tags is scanned, guests can customise their rooms virtually with an augmented reality art gallery available on their mobile device, featuring artwork from 18 LIFEWTR artists. Beyond the baobab trees – which are said to be sacred among the locals because of the natural healing powers they lock within their roots. 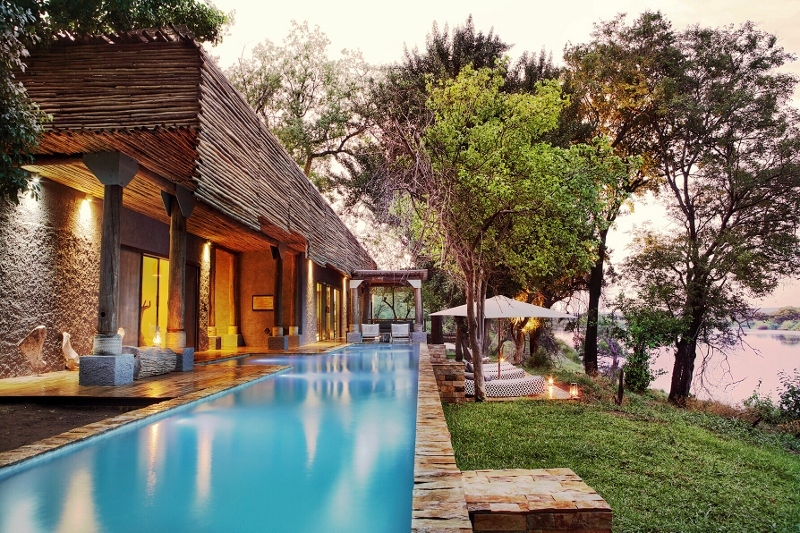 The dehydrated shrubs on the African soil, elephants, hyenas, zebras, warthogs, leapards and lions sits an award-winning luxury riverside hotel that is indubitably one of the most luxurious offerings in Zimbabwe. After 15 minutes 4x4ing the dirt road into the heart of the 123,000-acre (55,000 hectres) reserve, we arrive at Matetsi Victoria Falls, a place that promises luxury, comfort and unmatched style. “I have the largest back yard in Africa,” jokes the owner John Gardiner who greets me on arrival. And with nothing between us and the natural safari, my experience in the African bush begins. The entrance of the hotel is framed by three traditional Mokoro (dug-out) canoes, which hang from wooden beams and sway in harmony with the soft Zambezi breeze. With no need for a traditional lobby, guests are immediately welcomed into the indoor-outdoor public areas complete with a copper bar and durable outdoor sofas and chairs scattered in a home-from-home setting that has been designed around nature, and not the other way round. “We didn’t take out a single tree when designing these camps, because we wanted these areas to remain as close to nature as we could,” said interior designer Kerry van Leenhoff , a previous graduate from Cape Town University of Technology who was hand-selected by Gardiner and totally supported in all her decisions. Using the striking vista of the Zambezi River, which flows towards the tremendous Victoria Falls, dining tables are placed in such a way to make every meal one to remember. 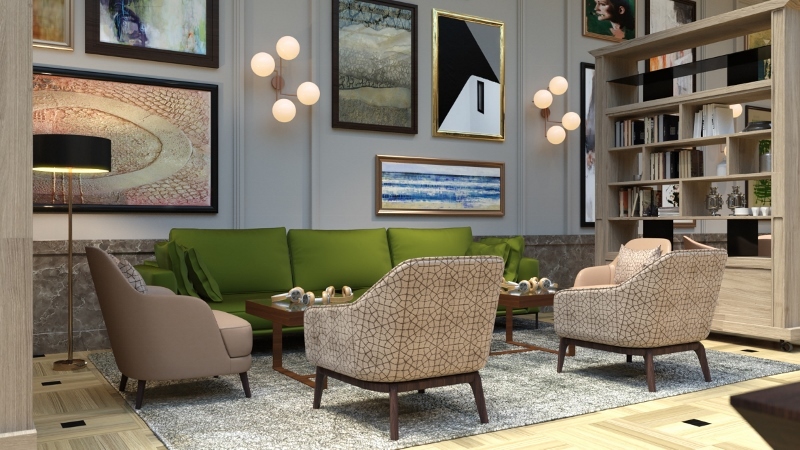 “The lobby areas have been designed in order to encourage guests to connect with people and nature,” adds van Leenhoff. As we approach suite 17 – AKA, my home for the next four nights – I am reminded just how ‘in the sticks’ we are, catching a glimpse of an elephant and a giraffe just metres from each other as my key enters the lock. I open the heavy, black teak front door, which was recycled and polished from the previous lodge, and the room is immediately filled with light. Interestingly enough, though, this was not the case when the hotel first opened, as van Leenhoff explains: “When the hotel first opened and the guests gave us their feedback, we realised that we needed to revisit the lighting, especially in the public areas,” she says. “So we added some more outdoor feature lighting around the trees and columns in order to really pronounce what we felt were the important and dramatic areas of the hotel.” However, my immediate attention is not on the lighting. Instead, my imagination is taken over by the striking panoramic view of the Zambezi River, which I later find out is home to legend; the locals believe that a famous God is said to protect the flowing waters, and his name is Nyami Nyami. As legend goes, the spirit which is often depicted as half snake half fish, protects life in and around the river. The River Lodge Suite is everything you would expect of a luxury lodge in the bush, and so much more. The skin of matepi latte creates an organic ceiling and roof – and this material does more than just give a nod to the location. This decision was made in order to keep the lodge blending into its location and celebrate Zimbabwean culture. 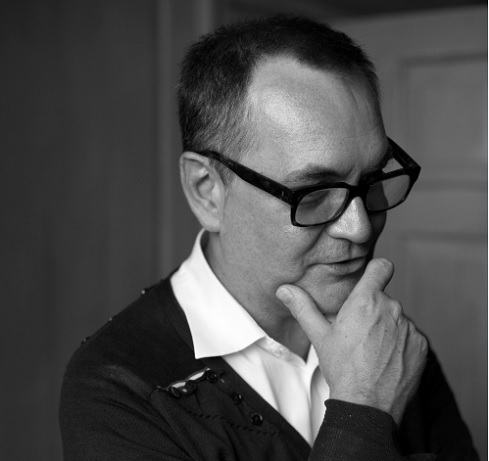 “It was really important for us to work with skilled craftsmen and women from our culture,” explains van Leenhoff. “We have such a diverse culture with about 16 different tribes and languages. We mainly focused around the Tonga tribes as we were by the river.” The result is that from the far side of the river, you can’t actually see where the hotel starts and ends, which suggests even further that the whole property has been created with nature in mind. Van Leenhoff decided to take Matetsi’s love for nature and the environment and inject it into the fabrics and the walls. The result is a naturally calming, peaceful abode, which empowers an everlasting feeling of total luxury and relaxation. Modern high-quality furniture and hand-scultpted trunks of trees used as tables create the perfect blend of modern, luxury and timeless décor. All 18 suites have been thoughtfully curated and the hotel is a credit to the talent of van Leenhoff. The art, for example is by Helen Teede who spent much time on site at Matetsi in order to find the inspiration of a unique collection of 18 paintings entitled ‘Mapping Matetsi’. Having done extensive walks and drives in the area, Teede divided the cartographic map of Matetsi unit seven into 18 parts and drew it to scale on each canvas, adding her own impressions of the river, the landscape and the pathways walked in the area, both man and animal-made. These 18 paintings hang separately in each suite. However, put together and these pieces of art actually form the aerial map of the reserve. With the privilege of space, the hotel shelters two camps: East Camp, West Camp and one large villa, River House, which sits in between the two camps. Interestingly, the whole team – chefs, butlers, housekeeping, back-of-house staff – alternate between both East and West camp every couple of weeks in order to maintain the property and keep service personable at all times. Gardiner, who I first met in London just a few weeks before my trip, is the real visionary behind the property surrounding the reserve. A local Zimbabwean hotelier, Gardiner has transformed the reserve since acquiring it in 2014 and aims to “give back to Zimbabwe”. With the help of his team, who all share Gardiner’s love for nature, he has restored and conserved the natural wildlife within the reserve by building various watering holes, 15 in total with a further 10 in the pipeline, I am told. Before I check out, I have an opportunity to exclusively discuss the future of Matetsi with the team and how it plans to expand its luxury arm. “We are working on a few things at the moment, which are really exciting projects,” adds van Leenhoff. 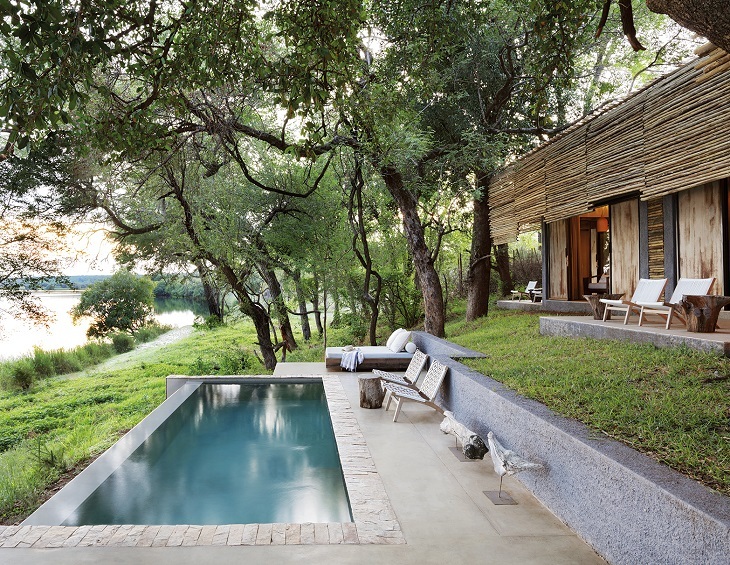 “The design direction and our aim is to strike the balance between feeling isolated and feeling safe.” The new plans will further challenge conventional luxury lodges in Africa with a real focus on opening up the guests to undisturbed nature. The future sounds exciting and it’s clear that the design team and the hotel are totally in sync with ideas, vision and what luxury in Africa should look like. I leave Matetsi and Zimbabwe having cemented my respect in African design and culture. I am grateful that the reserve’s calming atmosphere allowed me to relax and escape from the lively London scene, if not only for a few days. It’s official: art and photography is taking over Hotel Designs, and it is doing so in some serious style, highlight major accents on the walls from around the world. Following part 1, here is our second trip around the globe to source the best examples of art and photography hotels. The Banke Hotel 5*, as with all the Derby Hotel Collection’s properties, holds invaluable pieces of art from the private collection of Jordi Clos, the project manager of the group. Unique pieces are displayed on every floor for the pleasure of visitors and guests alike. On each level, and inside striking suites, guests can marvel the works of art, showcased in museum-style glass presentation boxes. The hotel exhibits Derby Hotels Collection’s most important collection of ethnic and archaeological jewelry from Africa, Pre-Columbian America and Asia. The collection is permanently displayed on each floor of the hotel in glass cases classified by culture. From Papua New Guinea, China, India and Tibet to the ancient tribes of Africa. Particularly notable are the ritual necklaces from Papua New Guinea, silver and ivory bracelets from Sri Lanka, shaman costumes from the Ivory Coast and talisman boxes from the Mali desert. The Cosmopolitan lobby digital art installation, curated by art consultant Susan Walsh, combines architecture, contemporary art and technology to create an unexpected and dynamic experience. Eight 15′ digital columns and a panel spanning the length of the front desk continuously display a curated library of digital art, transforming the space into an immersive living narrative that incorporates elegant, fantastical and often poetic interpretations of life’s travels. 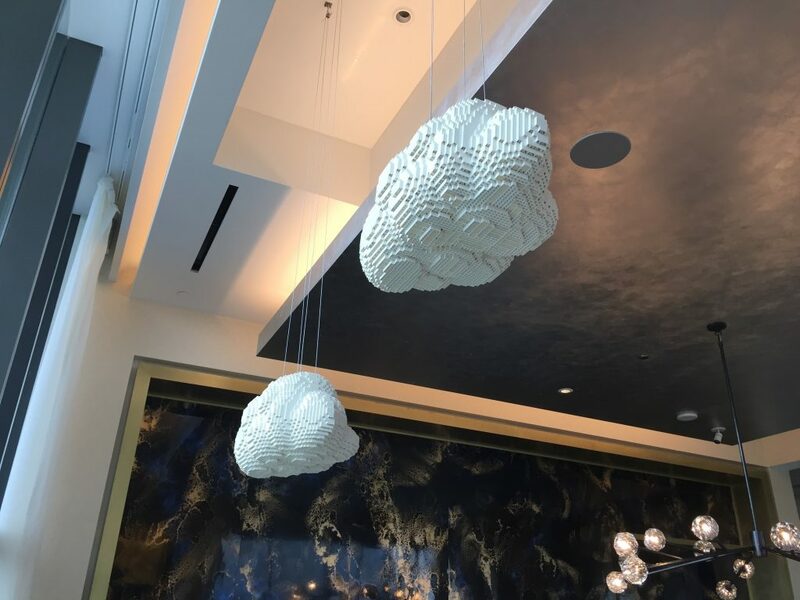 In addition, clouds made from lego pieces hang above guests’ heads in the public areas. 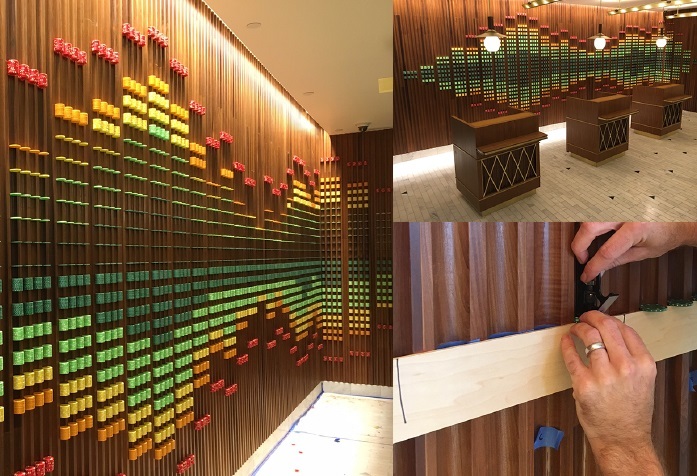 Behind a large check-in desk, set within timber-panelled wall surround, is a triptych of artworks by Croatian artist Antonia Čačić, specially-commissioned for the project by the scheme’s art consultants ARTIQ. The 3m-long abstract triptych incorporates a palette of soft hues inspired by the colours of the Dalmatian coast. Turning heads in London’s leafy Mayfair – not as leafy as its exterior – is The Anthenaeum. Withing the striking building hangs a stunning art narrative that has been curated by the talented art consulant, Robin Greene. The main entrance creates a warm first impression for guests as representations of perfumes compliment each pillar. 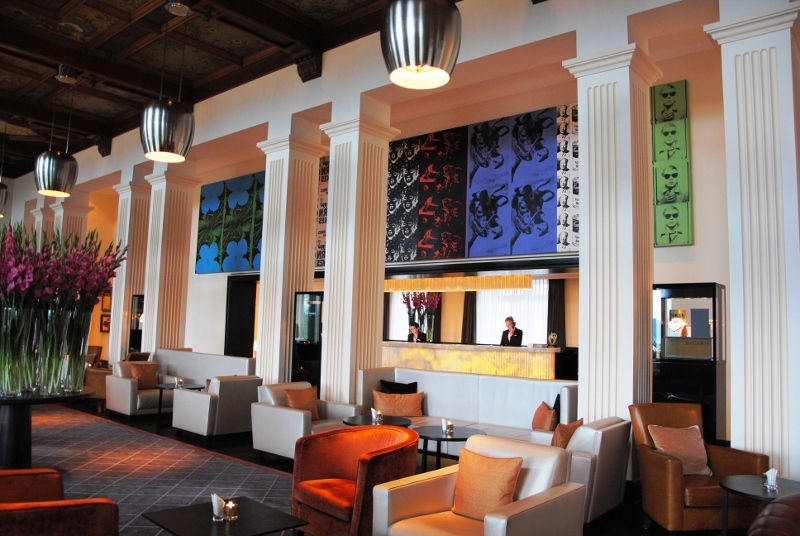 Since the reopening of the Dolder Grand in 2008, more than 100 works of art by prestigious artists have graced the premises of this luxury hotel in Zurich. 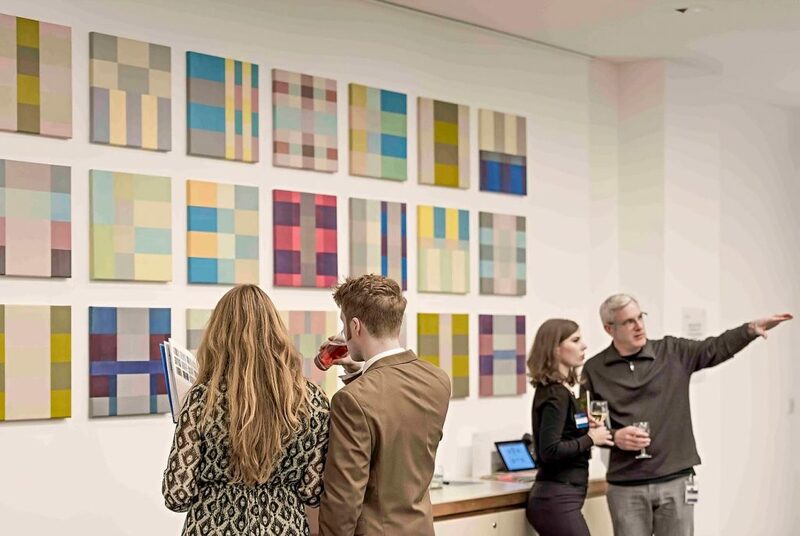 The most striking piece is arguably Andy Warhol’s “Big Retrospective Painting”, spanning 11 metres, which takes pride of place above the reception. Experience art at the Dolder Grand with our art ipads. Just months ago, I was catching up with who I consider the businesswoman of the year (certainly in the hotel design sphere that is). Priya Paul is a delightful woman who exudes warmth and charm. Her kindness, however, should not be confused for weakness, as her team hit a major milestone, having just recently celebrated THE Park Hotels’ 50th anniversary. Paul defiantly pushed her brands to visually be worlds apart from any other luxury hotel in India. 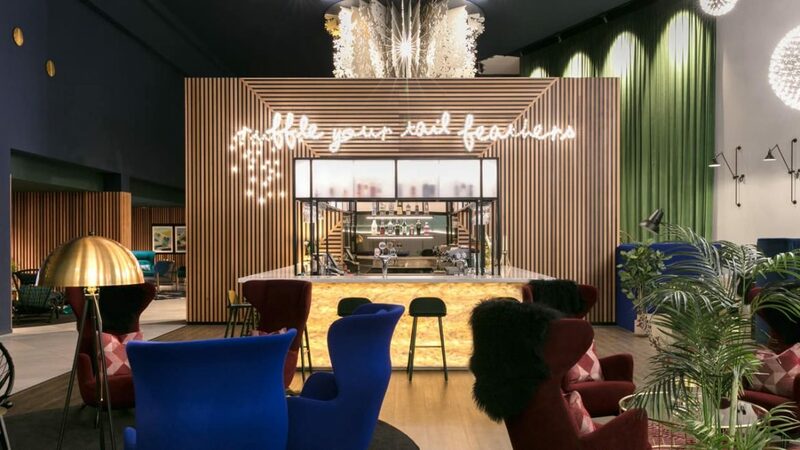 As well as providing personalised experiences for all guests checking in, each hotel in her portfolio is designed to be trendy, forward-thinking with art defining the hotel’s sense-of-place. THE Park is present in Bangalore*, Chennai*, Hyderabad*, Kochi, Kolkata*, Navi Mumbai, New Delhi* and Visakhapatnam. THE Park Collection is intimate, personalised, and tailored to transmit an inimitable guest experience. It includes The Park Calangute* (Goa), The Park Baga River (Goa), The Denmark Tavern (Kolkata) and a heritage hotel in Chettinad (2019). Its sister brand, Zone By THE Park, is also across India, currently with seven hotels with the focus on tier two cities. All of the hotels within the portfolio layer a strong emphasis of contemporary design in its private and public spaces. Style and luxury enhances everything – be it paintings, furniture, accessories or contemporary art. 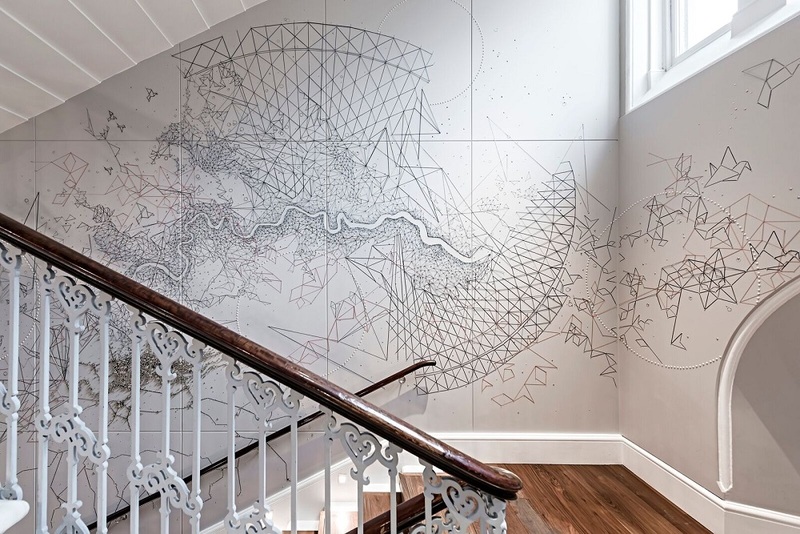 The brand is heightened by each property’s boutique concept through an art route. The art objects spread all over these star deluxe hotels, gives them a specific identity. Art in all its manifestations and forms are found in the various hotels. From traditional tribal art to edgy digital art and inspired installations enthrall our guests. Known artists share space with fresher inspiration. The result is a combination of dynamic interpretation of life. 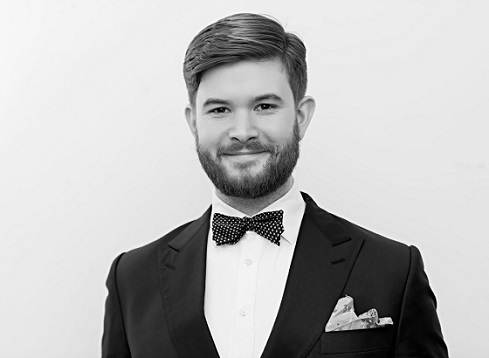 Hamish Kilburn: How much of the overall budget would you allocate to art in one of your hotels? Priya Paul: It depends from project to project . But it is about 5 per cent of the total budget of the project. 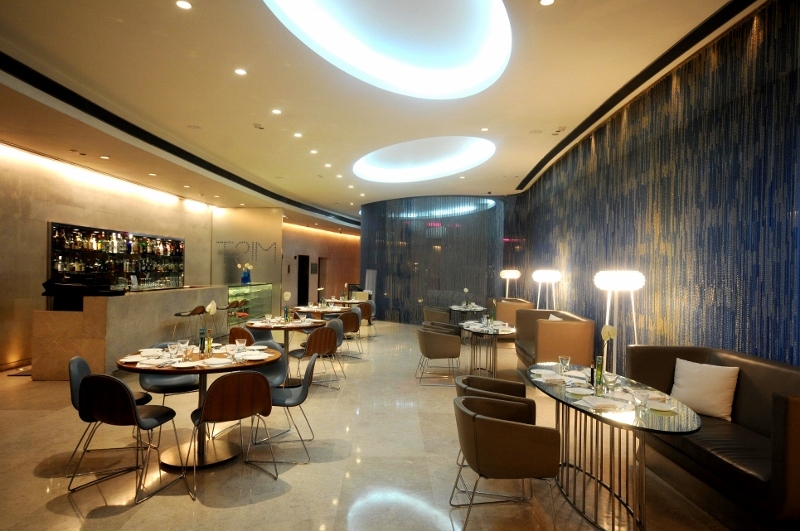 HK: How significant is good art in hotel design? PP: It is extremely significant for me. I have always believed in using art and local handicrafts for each of my hotels. I am extremely lucky that I work in India, where each region has wonderful traditional crafts people. I enjoy working with them and enable traditional art and crafts into contemporary work for my hotels. HK: You’re an experienced traveller. 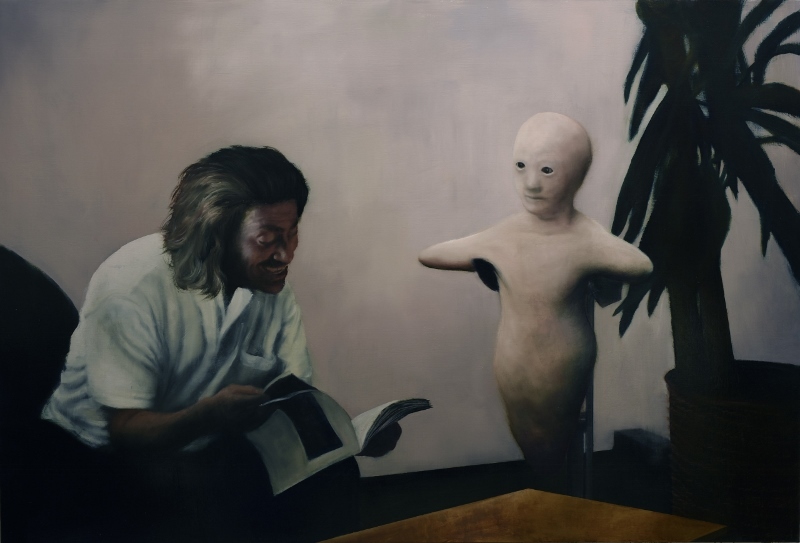 Without naming and shaming, what’s the worst art you have seen in hotels and how can hotels get it so wrong? PP: For me personally the worst is when the hotel has put no thought into it and buys completely non-descript copies, while there are so many young artists that can be encouraged. HK: How is art now being depicted beyond the frame in hotel design? 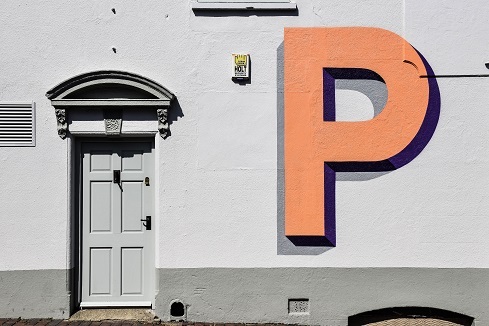 PP: Art is no longer something that hangs on the wall. We have used sculptures, ceramics and three-dimensional work in our hotels. We have used artworks as wallpapers and have even were the first ones to use video and digital art in hotels. Art is becoming more immersive. I know for my next project, I will work more with video and sound. The Park Chennai is an evocative luxury space located on the premises of erstwhile Gemini Film Studios. Elegant, Sensuous, Rich, it houses the theatre of life in its private and public spaces. The Hotel aims at creating a visual drama at every step. Well known artists have aptly brought out at The Park Hotels the chic and yet antique culture of Chennai. The Lotus is the national flower of India and a sculpture by Hemi Bawa was chosen to be placed at the entrance of the hotel as a welcoming gesture. The Steel at the base depicts the water while the granite pebbles provide a shimmering effect. It exemplifies the fusion at various levels – of light and shadow, natural and manmade. Manish Nai, an abstract artist has worked with mixed mediums like jute, paper etc. Born in 1980, he has completed his course from the L.S.Raheja School of Art, Mumbai. His works are also exhibited in Art Access Weel at Birla Academy, Nehru Centre and Cymroza Art Gallery. He exhibits his work at the lobby of THE Park Chennai. Meanwhile, artist Sonja Weder’s work exhibits at 601 restaurant. She has used natural vegetation that is processed and laminated like her current exhibits the banana leaf and the flame of the forest. Eminent sculptor Ray Mecker currently settled in Pondicherry uses ceramic as his medium for his abstract art which is displayed at the Atrium on the fourth floor. THE Park Chennai proudly associates itself with talented art photographers who have lended their work at the public and private spaces of the hotel. To name a few they are Amit Pasricha, Sheena Sippy, Bharat Sikka, Bharat Ramaruthnam. In the Pasha, there is a sculpture called HIGH at the entrance, a unique light sculpture by Krishnaraj Chonat is in the shape of a giant eagle suspended from the ceiling. Its bright red glow warms the white pearl encrusted silver leather wings. Lobby comes alive every evening with the digitized projection of films on large screens. Digital art in the lift is by Sonia Khurana. Also in the lift are computer games and cartoons reflecting the changing times and tastes. The first contemporary Indian boutique hotel is small, luxurious and intimate. The first boutique hotel is all about style – a specially designed environment that creates a wealth of experience. Tatler Magazine in its definitive Travel Guide 2003 has rated this as one of the 101 best hotels in the world. It is a unique 109 -room experience, designed by Conran & Partners, UK. The design philosophy is a fusion of the vibrant colours and landscapes of India with International style. Each area is specially designed to provide a richer and more sensual interaction. The hotel draws on Indian sensations and environment to provide travelers an ‘urban retreat’. The pristine white four-storied structure belies the luxury and flamboyance of the interiors. Flashes of brilliant colour from the balcony windows break the façade. Lobby: The main attraction in the lobby is an intricately carved black wooden pillar specially crafted by local craftsmen. The artistic pillar is a fusion of local hoysala art form and the much talked about Khajuraho art form. The pillar provides an exciting relief by its Indian feel amidst the contemporary feel of the lobby. i-bar: The art installation at the I-bar is a backlit graphic, which is inspired by the focus on technology in the city also famous for silk. There are colourful strands, which depict silk threads and wires. Words like click, touch, feel that feature in the installation enhance the human angle to the piece. Paintings by Jiteh Kalet are strategically placed at the entrance to the bar. Coloured Photographs by Sanjay Acharya, Gurinder Osan, Manish Swaroop. The second and third floor has images by French photographer Laurent de Gaulle. Fourth floor sees the work of Nitin Upadhaya. Each room at The Park, Bangalore has black and white photographs showcasing the essence of the Garden City’s sights, sounds and scents. Saibal Das and Fawzan Hussain were specially commissioned to capture on film the city’s various moods across 24-hours – from daybreak at Cubbon Park to the bright night lights of MG road. These are an extension of The Park Hotels’ ideology – to incorporate the essence of the city in which it is located, into the design of its hotels. Flagging off the heart of the Capital’s business and entertainment center, stands The Park New Delhi. It overlooks the historic 18th century Jantar Mantar Observatory and is in the city’s hub – Connaught Place. The artists that you are likely to see here are AK Raina, Shobha Broota, Jagdish Dey, Altaf Hussain, Yusuf Arrakal, Ojha, Priya Ravish Mehra, Manish Kansara, Sukhvinder Singh, Morden Madhvani, Paramjit Singh, Pooja Broota, Hema Joshi. The Park, Vizag, spread over 7 acres of spectacular landscaped lawns, overlooking the Bay of Bengal, has a perfect, picturesque ambience as an urban beach resort. The Park’s location offers sandy beaches complete with a lighthouse to underline the romance of the sea with breathtaking sunrises and lovely tropical gardens. The art and décor of the hotel has traces of tribal art of Andhra Pradesh and the tropical themed landscaped lawns are co-related with the influence of Buddhist ruins found in and around the area. Sculptures of Apsaras in stone greet you as you enter the hotel. The lobby also boats of Tribal Art from the neighboring Arakku Valley (Sculpture of Dristi Dolls) and traditional kalamkari paintings. Paintings by Kiran Rathore and Manish Gupta adorn the walls of the lift lobbies. The outdoor crafts court depicting the story of Ramayana is the creation of local artist Sairam. These pillars are perfect examples of Savara Art. In my editor’s letter in The Brit List 2018, which can be read here, I ask why it is that a tiny spec of land in the Northern Hemisphere could have such a large impact on the rest of the world. Well, my question was answered last night in a private members club as the industry’s leaders gathered for the unveiling of The List as well as our newly launched awards. It was a truly spectacular evening, full of engaging talks, insights, lighting demonstrations and plenty of tension as the winners were revealed. One thing is for certain, Britain is – and will continue to be – a major design hub of the world. Congratulations to the full 75 individuals who made it on to this year’s The Brit List, who have each proven that they are leading the way in international hotel design from the shores of Britain. 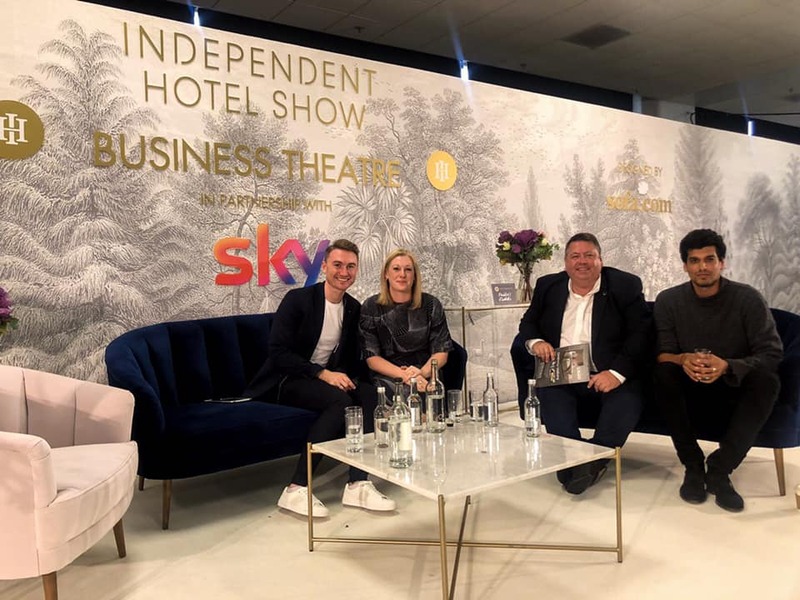 Martin Brudnizki Design Studio, Gleneagles’ Conor O’Leary and Bespoke Hotels among those who swooped trophies at The Brit List 2018. 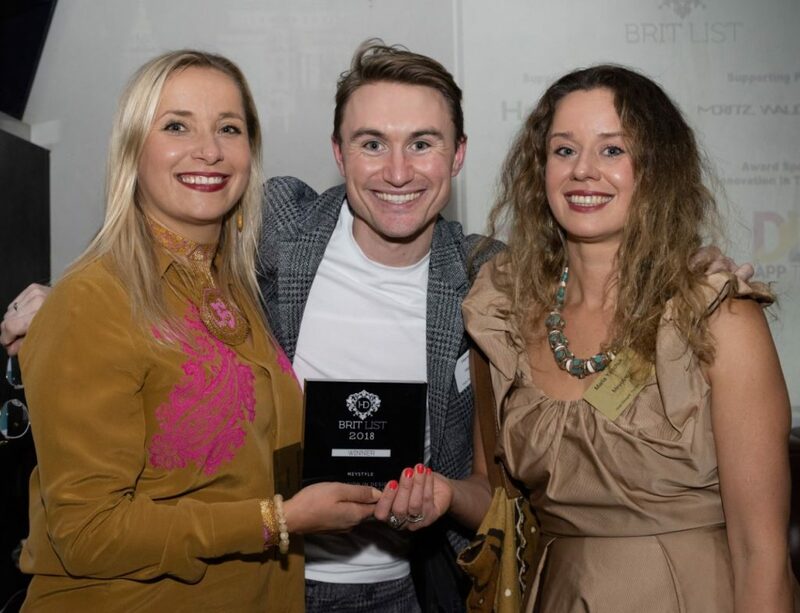 Britain’s top interior designers, hoteliers, architects and key-industry suppliers gathered last night for The Brit List 2018 at BEAT London, where the profiles of the top 75 influencers in British hotel design, as well as crowning the winners of the six newly launched awards. Restaurant and hotel interior design specialist, B3 Designers has recently unveiled its latest interior design and branding project. Champions Bar & Restaurant, located within Frankfurt’s Marriott hotel, is a European sports bar and restaurant serving classic bar dishes and drinks in the German city’s central district of Innenstadt. 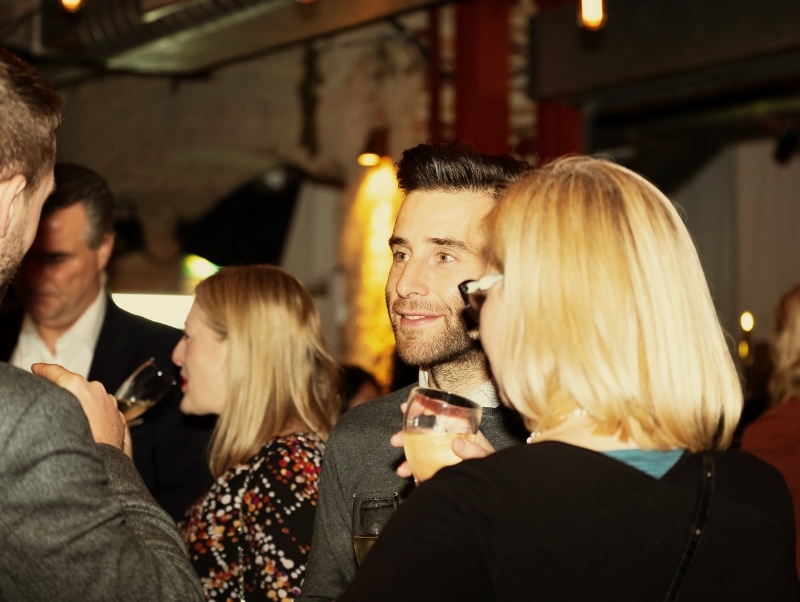 The Brit List 2018 took place last night at BEAT London, welcoming the top interior designers, hoteliers, architects and key-industry suppliers to network and mingle to celebrate Britain’s position in international hotel design. Here are the official images of the evening. 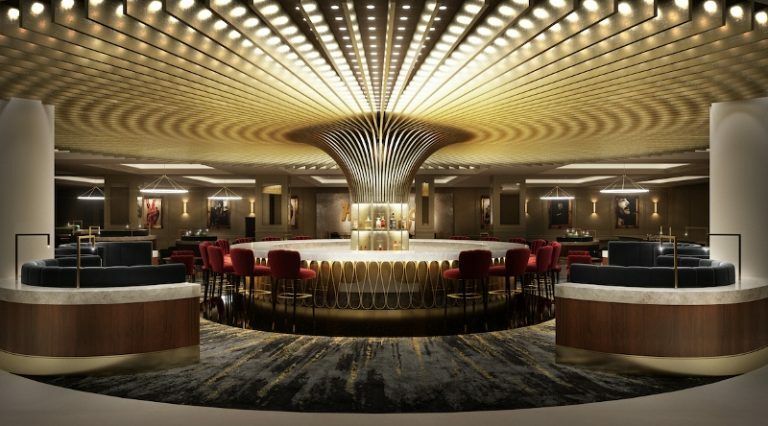 InterContinental Hotels Group (IHG), as one of the world’s leading hotel companies, has opened InterContinental Shanghai Wonderland, which has been under construction for the past 10 year. 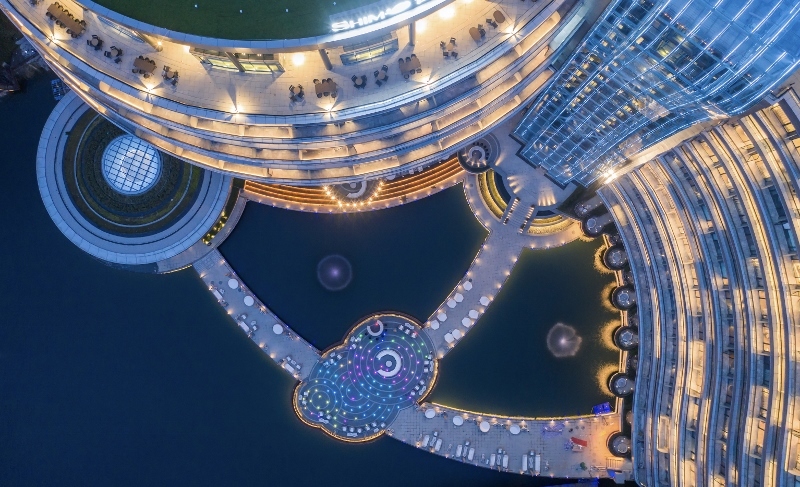 Developed by Shimao Group and managed by IHG, InterContinental Shanghai Wonderland has been masterfully built into the side wall of a formerly abandoned quarry in Southwestern Shanghai. Stretching 88 metres underground, the hotel was nominated as one of the architectural wonders of the world by the National Geographic Channel’s MegaStructures series due to its pioneering architectural design. With luxury brands and high-end retailers of Knightsbridge just off the main entrance and the artistic heart of Chelsea just off the side entrance, the 54-key Belmond Cadogan Hotel, which will open in February 2019, is ideally located in the heart of London in between the two fashionable districts, somewhat capturing the best of both worlds. 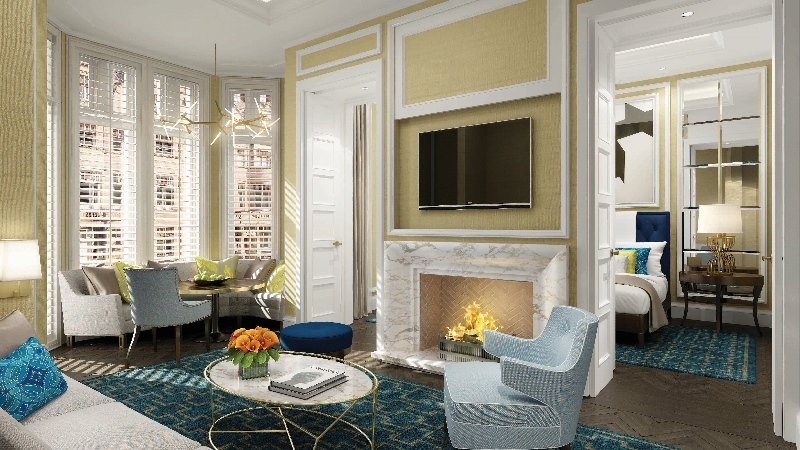 Belmond, with architecture leadership by Blair Associates, have carefully preserved the London legacy of the property by sensitively restoring five 1800s Queen Anne-Style buildings that are unique to both aptly leafy neighborhoods. What is described on its website as being ‘truly a welcome home’, the hotel has been renovated to balance – like its location – a distinct feeling of comfort and style. Inside the property, the interior design will reflect modern British style with a distinctive contemporary feel. Much of the inspiration draws inspiration from the hotel’s original features. Steeped in colourful history, the hotel’s many walls tell many fascinating tales from Oscar Wilde to Lillie Langtry, both of whom were regular residents at the hotel. The restaurant and bar are in the hotel have been designed by Russell Sage Studio, while the guestrooms and suites have been carefully imagined and created by GA Design International. 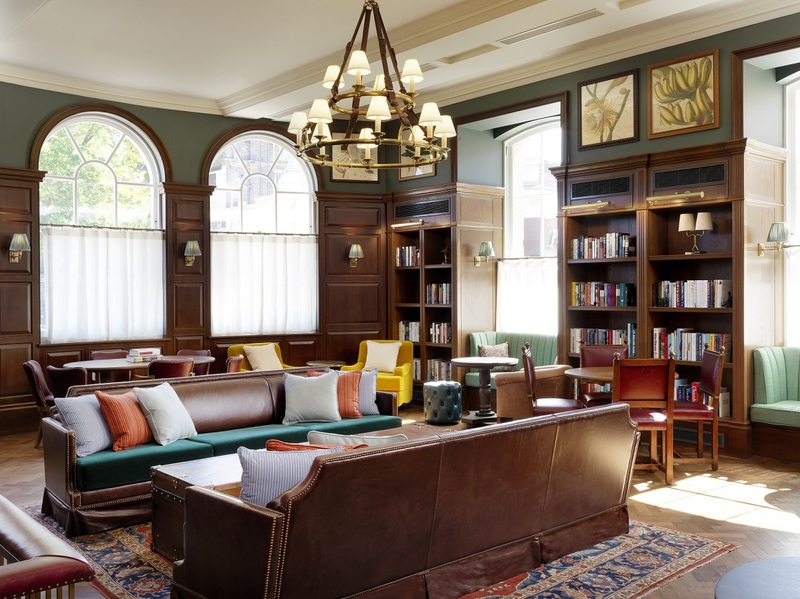 The firm’s global executive design director (London), Terry Mcginnty, has been shortlisted for The Brit List 2018 for his work on previous iconic hotels as well as the work his team are completing for Belmond Cadogan Hotel. Considering art is a major feature of this month, more than 400 pieces of original artwork will be found throughout the hotel, from more than 20 artists, many of whom are UK-based. 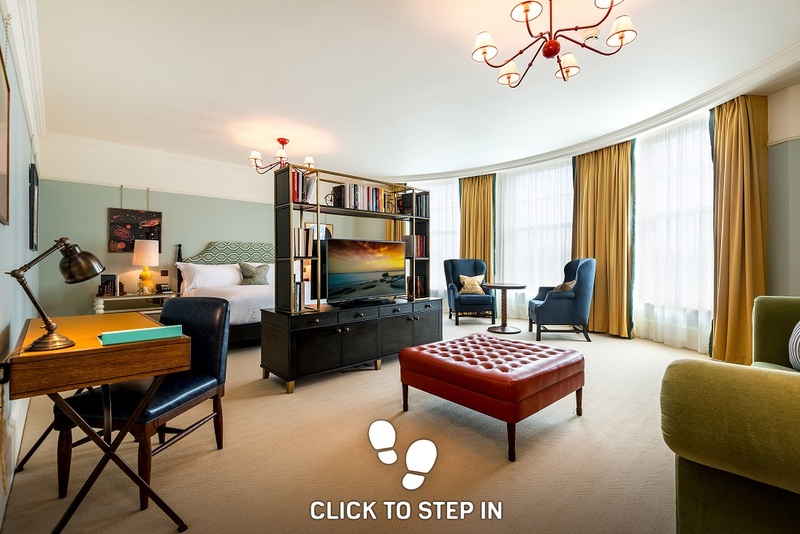 Guests checking in will have access to the private Cadogan Place gardens (one of Chelsea’s largest garden squares and once site of the 18thcentury London Botanic Gardens) and for complete privacy, a residential entrance is accessible via Pony Street. Conrad Washington, DC has announced that it will open its doors in February 2019. The 360-key hotel, situated at the corner of New York Avenue and 10th Street NW, is the first for Conrad Hotels & Resorts in the nation’s capital. The property is designed to bring Washington hospitality into a new era of modern luxury with its unique architecture, sleek interior design, inspired art collection and culinary offerings led by world-renowned chefs. 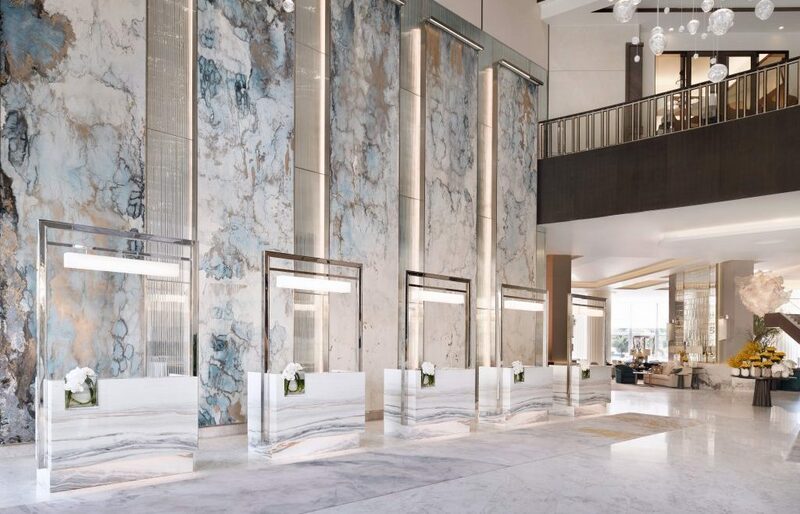 Conrad Washington, DC features a sleek all-glass exterior that wraps around its 10 floors, 360 rooms and 30,000 square feet of high-end retail space below the hotel on the ground floor. The hotel’s concept was envisioned by renowned Swiss architecture firm Herzog & de Meuron, best known for landmark projects like the Olympic Stadium in Beijing and The Tate Modern in London. Architect of Record, HKS Inc., served as the Production Architect on the project. Consultant Rottet Studio designed the interiors as a restrained, minimalist expression of purity of thought and design, to complement the carefully conceived building. Following the Hotel Designs’ focus this month on art and photography, the hotel also features a contemporary art story that is weaved throughout a unique collection inspired by the Washington Color School movement, curated by consulting firm Tatar Art Projects. Conrad Hotels & Resorts is a portfolio of 34 luxury properties spanning 21 countries, all of which offer guests a seamless connection between design, innovation and culture. The luxury hotel brand was established in 1982 and has properties in the world’s most desirable locations, including metropolitan cities such as New York, Hong Kong and London and leisure destinations such as the Maldives, Bora Bora and Koh Samui. As part of Hilton, Conrad Washington, DC will participate in Hilton Honors, the award-winning guest-loyalty program for Hilton’s 15 distinct hotel brands. Members who book directly have access to instant benefits, including a flexible payment slider that allows members to choose nearly any combination of Points and money to book a stay at an exclusive member discount. Conrad Washington, DC will be managed by Hilton Management Services. The most common answer I hear when I ask designers, architects and hoteliers where they source their inspiration from is ‘everywhere’. The more I hear this answer, the more I sit and wonder how far-reaching everywhere can be, and can anything really spark the concept of a great idea? If you’re looking for a company that is pushing the boundaries in where inspiration can be found, look no further. The creative genius’ at Zaha Hadid Design demonstrated to the world late last month that design has no ceiling. The design firm unveiled a new collection of fitness clothing, believe it or not, having turned to the arena of performance sportswear to find new ideas and (that key word) inspiration. Since this product dropped, the thought that inspiration can lead to innovation has been a theme that has seamlessly weaved itself into the majority of this week’s headlines. 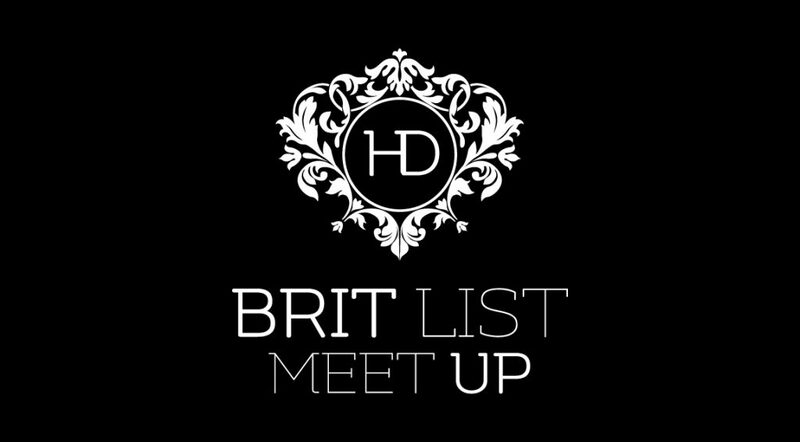 This comes as the team at Hotel Designs prepare to unveil The Brit List 2018, which will name the top 75 inspirational individuals (designers, hoteliers and architects) who are keeping Britain at the centre of the design world. Prepare to be inspired, ladies and gentlemen, as we break down this week’s top five stories. Known artist Beth Nicholas is used to seeing her masterpieces on the walls of some of the world’s finest examples of hotel design. 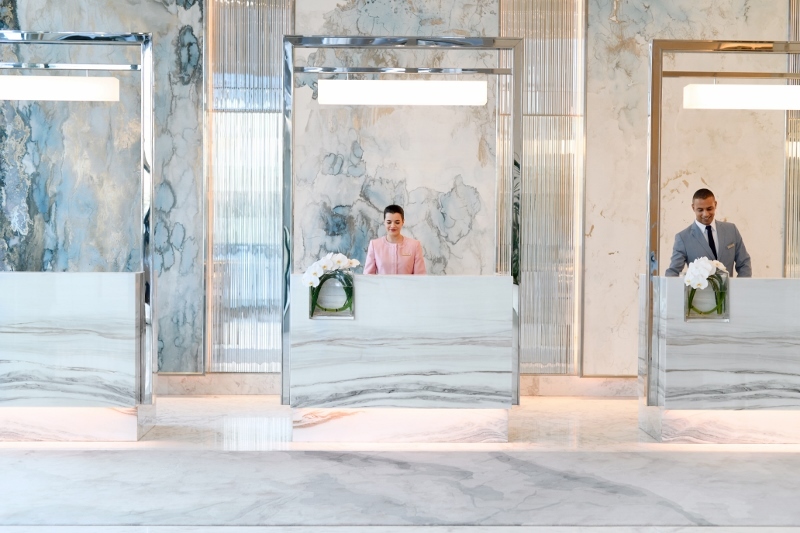 Among working with clients such as Christian Louboutin, Langham Hotels and Waldorf Astoria, one of the most challenging briefs came recently when she was asked to create a large art installation for The Address Downtown Dubai‘s lobby area. 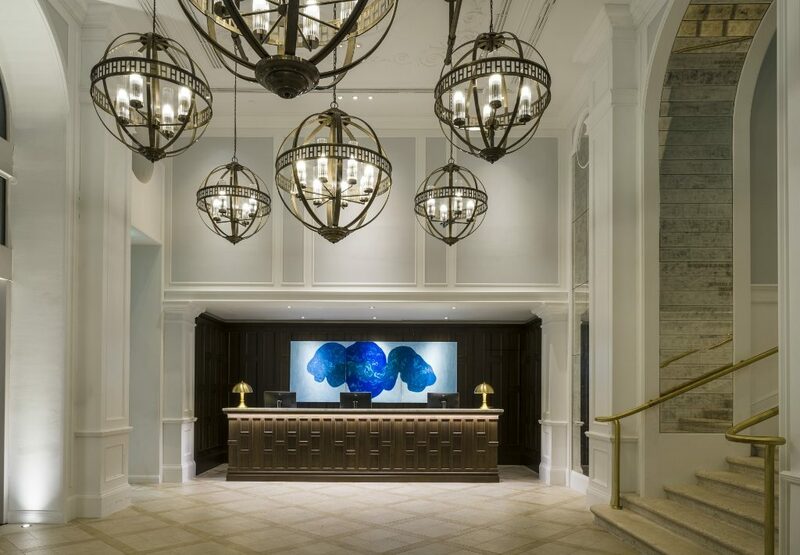 I was fortunate enough to catch up with Nicholas after the hotel had reopened and she could finally take a sigh of relief now that her art is the first impression for guests checking in. Design giant Zaha Hadid Design unveils collaboration with a Swiss performance sportswear brand, suggesting that inspiration for designers and architects is not limited to one – or even two – industries. Hamish Kilburn investigates. 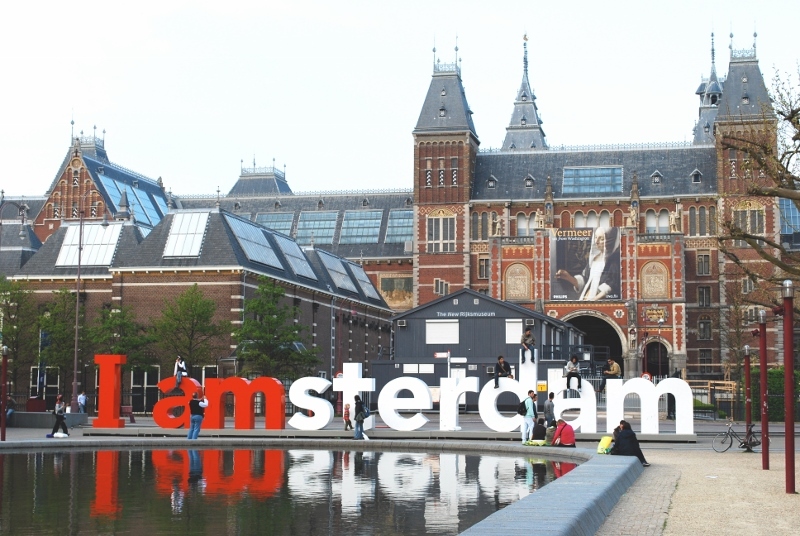 Investors have named Amsterdam as the most attractive European city for hotel investment for the third year in a row, according to the 2018 European Hotel Investment Survey from Deloitte. The findings, based on responses from 122 senior hospitality figures from across the world, are revealed ahead of the 30th annual European Hotel Investment Conference taking place in London this week. 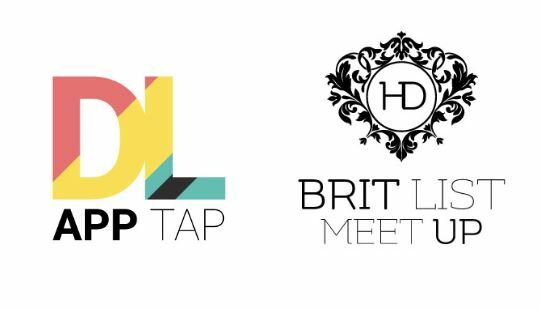 Following its official launch at the Independent Hotel Show last month, DLAppTap has been confirmed as the official Sponsor of the Innovation In Technology Award at the The Brit List 2018. Hamish Kilburn: What was the design brief? Beth Nicholas: Essentially, I was just asked to paint big, really big. I have never had a commission that was 8.5 metres before – and it was gob-smacking figuring out how to do that. I don’t tend to get design briefs from clients that often. What I get instead is people asking me about specific colours. With The Address Downtown we developed a colourway that had both silver and gold in it, as well as my iconic blue. 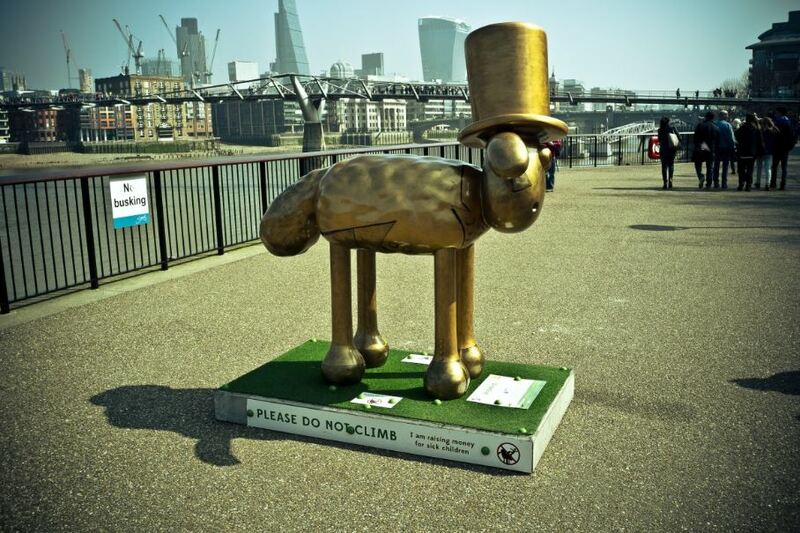 Soho Myriad, who were the art consultants for that, really like to challenge their artists. Quite often, they ask you to produce something larger than what you would usually go, but this particular project took that to new heights, literally. I don’t think they have ever commissioned anything quite that large. HK: In regards to this particular project, what inspired you? BN: Honestly, I have never seen marble like it; it’s utterly beautiful! There is some marble in that entrance lobby that is purple and they have split the marble down the middle and turned it. The result is like a mirror image, a bit like when you were a child and folded paper over paint. My work resembles that material in a lot of ways with a lot of natural formations that are very similar to some of the lines and shapes within marble. I had been given a lot of information about the space and the rest of the colours that were used in the hotel. That inspired the work. HK: How long did it take? The brief came about a year and half before I produced the work. The production of the pieces took three months, and my normal technique did not work. To be honest, everything that could go wrong did go wrong. I had to hire a warehouse outside Newport. It was an old, former carpet warehouse and there were holes in the ceiling. I remember it like it was yesterday. It was Autumn, so the rain had started. I would come into the space in the morning to find raindrops on my work. On top of this, I had to essentially create a new technique because my usual technique did not work at that scale. That was terrifying. On top of all of that, my work takes a while to dry. As the weather was getting worse, my pieces would take longer to dry and I was running out of time. As a solution, I hired massive turbo air dryers – it looked like a scene out of Singing In The Rain – and eventually I figured it out, but it was certainly a challenge. BN: I have been in love with the aesthetic of Wabi-Sabi for a long time. Every time I describe what it means, it’s different. Wabi-Sabi is a Japanese concept that is very difficult to translate into English. Part of Wabi-Sabi is to appreciate the concept of transients that move and shape over time. I often think of my work in relation to that beautiful Japanese pottery, where they fill the gaps with gold. If you look at my work, you see similar cracks as you do in ceramics. I can’t produce a painting that is exactly the same as the last one, and so my work is very detailed. So Wabi-Sabi, for me, is the exploration of how things have changed and developed, which is why there is so my synergy between my work and the environment. Nicholas’ work is evocative of oceans and the minerals beneath the earth as well as aerial photographs. The paintings are rendered in ink and applied to sheets of paper which are illuminated from behind, further enhancing their impact. 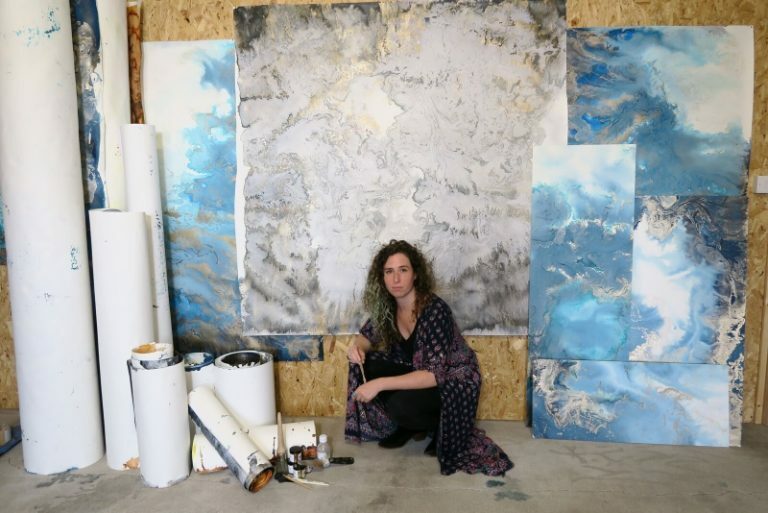 Since launching her eponymously-named company, Beth Nicholas Studios, in 2009, Nicholas’s paintings have won plaudits for their beauty and originality, are created through a unique method which she constantly evolves through trial and experimentation. After much anticipation, I’m excited to announce our ‘Spotlight On’ feature this month focusing on art and photography is well and truly underway. 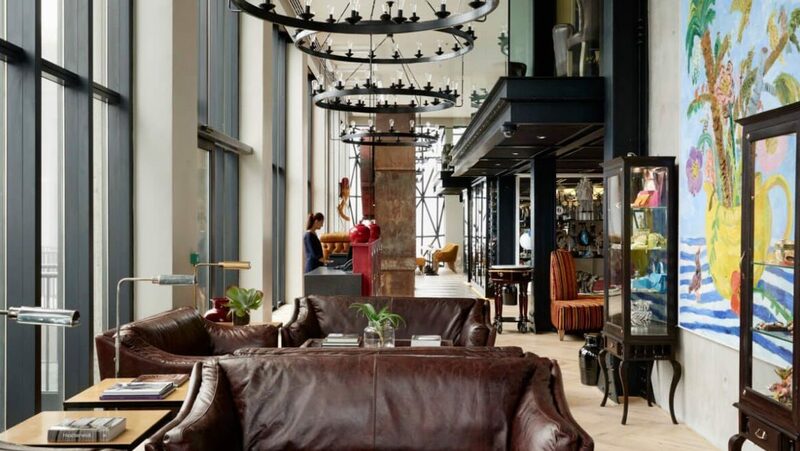 The topic, as well as releasing some serious creativity on the editorial desk, is a significant one for Hotel Designs. It arrives as rumours emerge that too many hotel owners around the world are cutting art budgets and are, therefore, refusing to see the value in art in international hotel design. Starting with a whistle-stop tour around seven of the world’s finest art hotels, we would like to share our admiration for those who do see the value, and I promise to, over the next 28 days, recognise and amplify those hotels from around the globe that are using art and photography to stand out from the crowd. New design renders have been released showcasing Liverpool’s latest design hotel, Seel Street Hotel by EPIC, which is scheduled to open to the public in early December 2018. 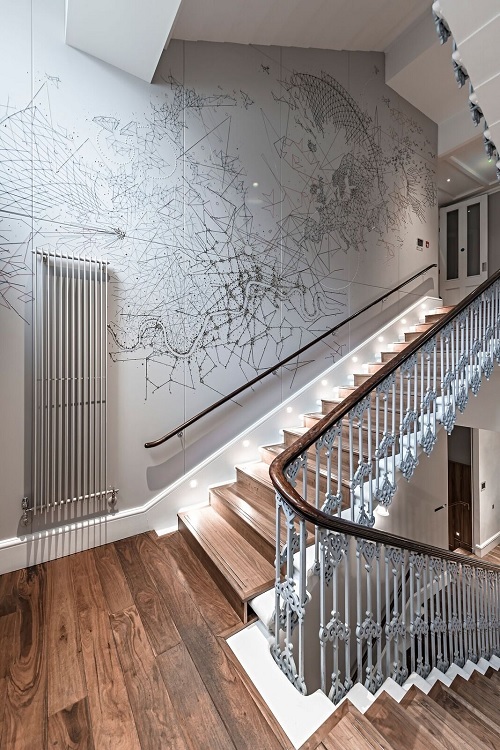 The exclusive visuals of the 128-key hotel, developed by Elliot Group and designed by Liverpool-based Falconer Chester Hall, throw the spotlight on the property’s flagship ‘WOW! 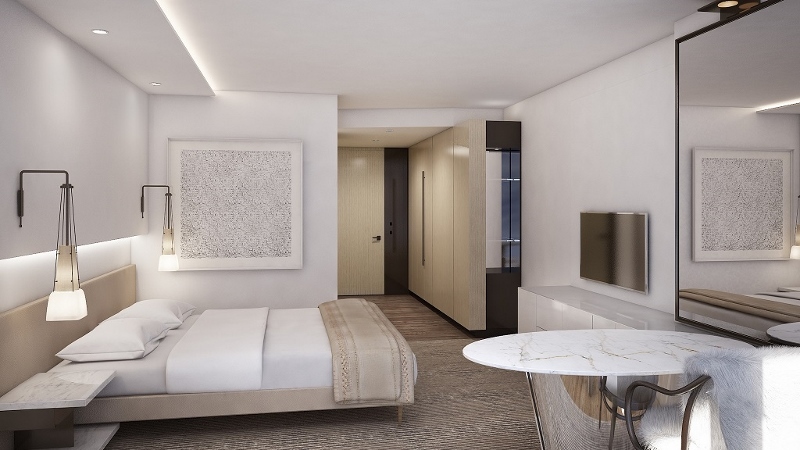 Suite’ – a striking corner suite with external space providing sensational city views and set to raise the bar in the city’s expanding hotel sector. With scaled-back interiors, completed with industrial-like exposed wardrobes and a palette of warm blues and browns, the rooms are cosy, inviting and modern. 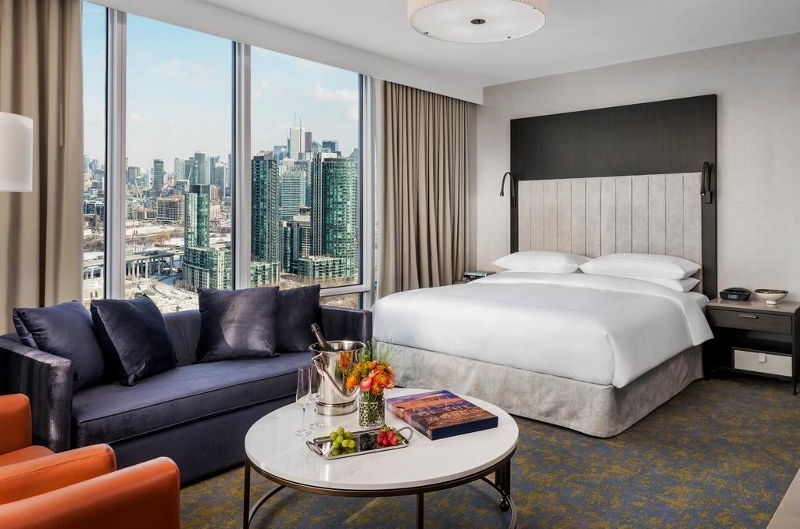 Also revealed is the hotel’s spacious Super Luxe suites with outside terraces and skyline vistas, and the ultra-contemporary Cinema Room, offering what is said to be the ultimate guest experience without having to leave the room. Concluding this year’s nationwide search to find Britain’s top young artists, 23 shortlisted students -from Brighton to Newcastle – were invited to last night’s final of the Graduate Art Prize 2018. 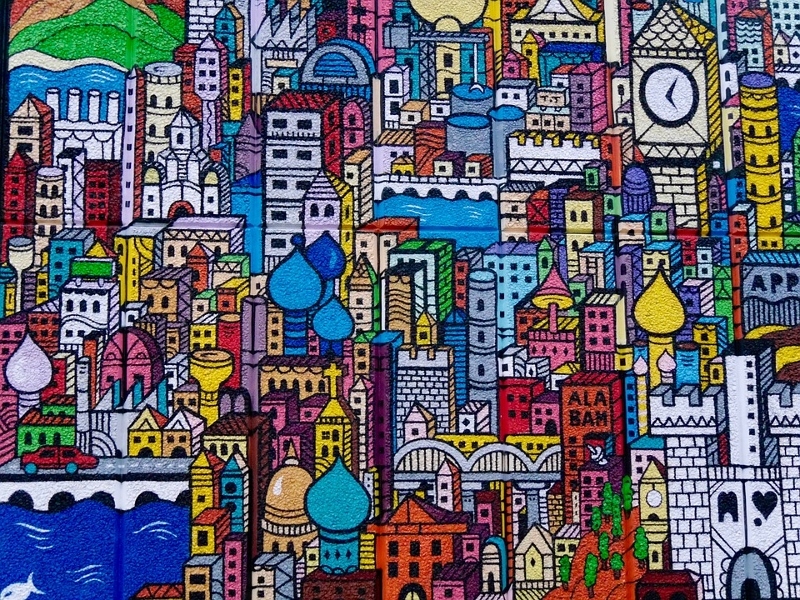 Launched in 2012 by art consultants ARTIQ, the awards ceremony, which this year was sponsored by Herbert Smith Freehills and Atlantis Art Supplies, is recognised as a major platform for young artists to amplify their work to leading designers and hoteliers in Britain and beyond. 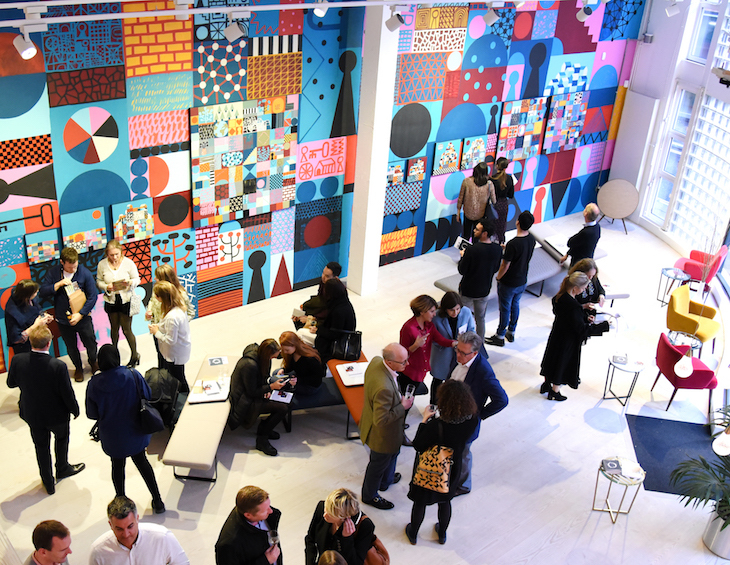 It was at a restaurant launch in Kent, England, where I first met the talented Lawrence Hosannah Myse, a New York-based artist who specialises in large, statement-like wall murals. His work, which was unveiled on the facade and interiors of the property, echoed the good vibes of that authentic Caribbean restaurant creates and pictured a rural Jamaican scene perfectly. Following this was the realisation of how this warmth and character that had been sprayed onto the walls of Jerk Shack could very well help to define a hotel’s sense of place within a city or town and general theme. As mentioned in a recent popular Hotel Designs article, art is not limited to frame. Soon – in between the artist jet-setting from London to LA – Hosannah and I were sitting down for coffee to explore the endless possibilities of wall murals in hotel interior and exterior design. “Our aim is to bring nature into urban environments – or areas that are typically more architectural and man-made,” said Hosannah. 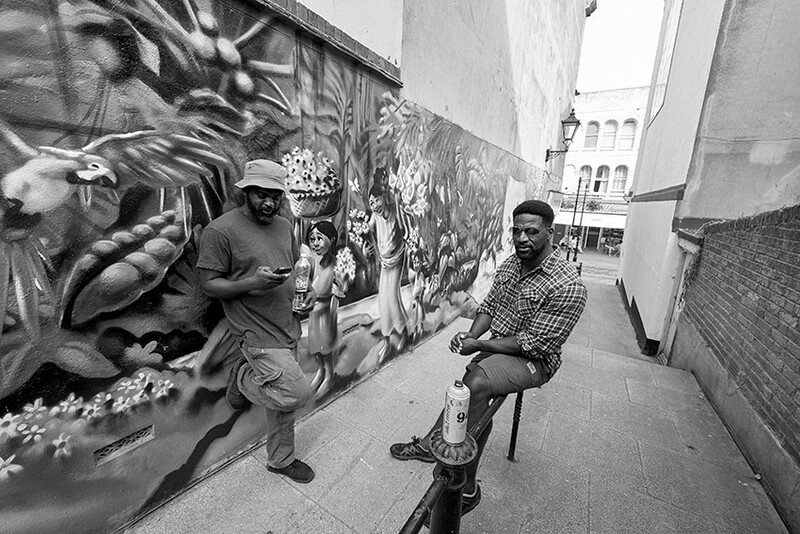 “My brother and I like to create experiences where consumers get sucked in.” A pair of true creatives, I get the feeling that the Hosannah brothers see beyond a hotel or a restaurant and look into the narrative of a theme that will help the owner of the property put it on the map. “It’s almost like a dance,” he said when describing how he and his brother work with his clients. “We start by first understanding the vibe, the essence of the place and the people using it. We will then draw up some sketches before solidify them into developed drawings. For Jerk Shack, for example, we had some images of Jamaican rainforests, animals and flowers and with those clear visuals, we were able to almost freestyle the walls.” The result was a scene of the real Jamaica, from the outside in. The exterior, a deep-green jungle creates a statement among the other buildings. Upon entering, the interiors of the restaurant open up to reveal pristine-white beaches fused with deep-blue ocean coasts and tropical plants. Hamish Kilburn: What’s your favourite colour at the moment? HK: What’s your number-one tool for success? HK: What’s your biggest bugbear when it comes to your industry? LH: The amount of people that do not understand the true vale of art and it’s importance. HK: Who has inspired your dreams as an artist? 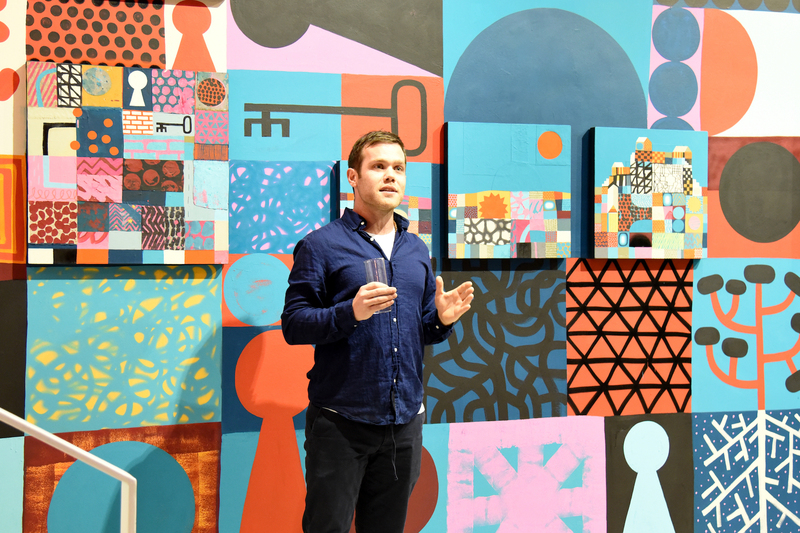 LH: So many people, from a variety of art teachers to graffiti artists, such as Andy Trate, Seen, Murakami and Diego Rivera… There are too many to list. “Art is weird,” concluded Hosannah. “It’s not like being a doctor or a lawyer where you have a clear career path. Art, and being an artist, is a world for the for the brave and courageous where you create and you go, which can be scary but it can also be invigorating.” My time with Hosannah ends with mixed emotions. It seems as if there is not currently enough awareness – within our industry and beyond – on the possibilities of art. 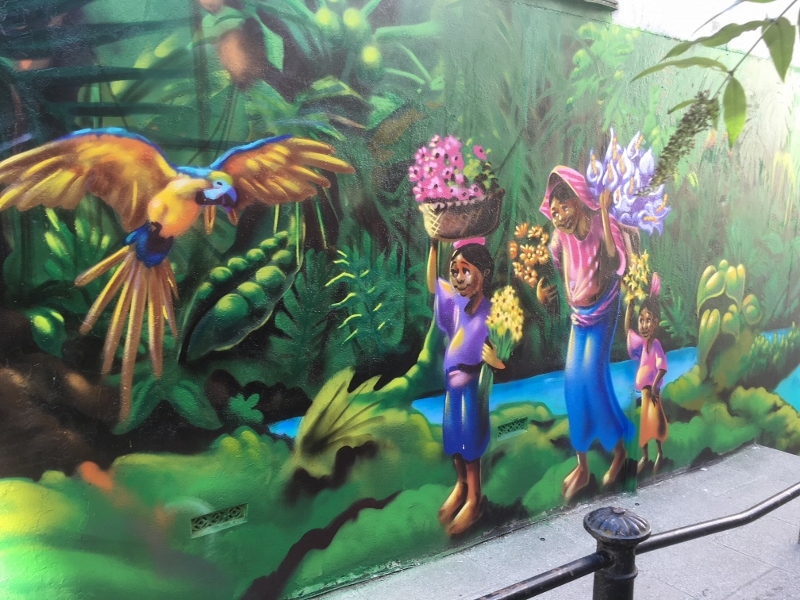 To counter-balance this, I feel as if many hotels around the globe, regardless of the theme, could benefit from the life and soul that wall murals can give to a property. The evening showcased the variety of different art styles, motifs and concepts from each of the 23 finalists before the crowd gathered to hear the announcement to reveal who this year’s publicly voted for runner-up and cash-prize winner was. 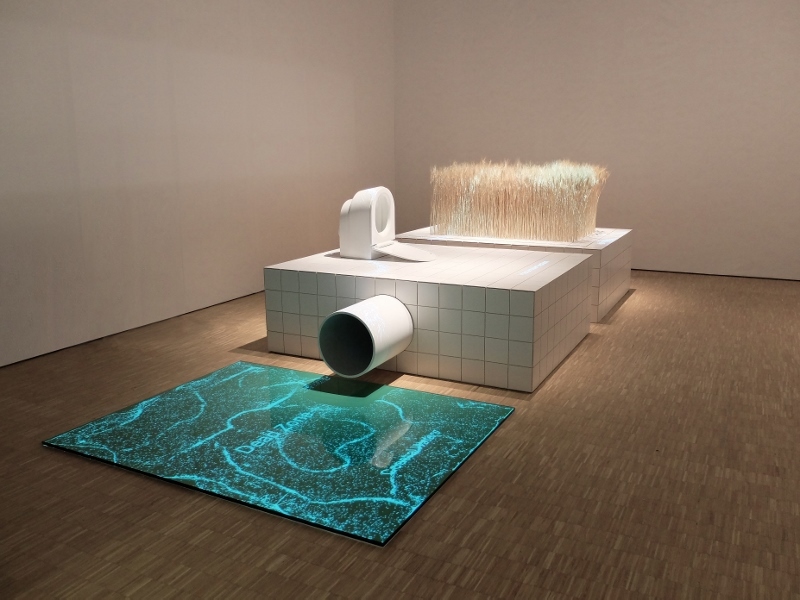 Commenting on his win, Bargiotas said: “It is truly a pleasure to be a part of the Artiq Graduate Art Prize. Winning the prize has functioned as a vehicle to communicate my cosmology to an audience outside of the strictly academic world, which is a necessary process for artist and audience. Organisations like Artiq provide this bridge between the introverted word of image-making and the hungry eyes of image appreciators and for this I am grateful. 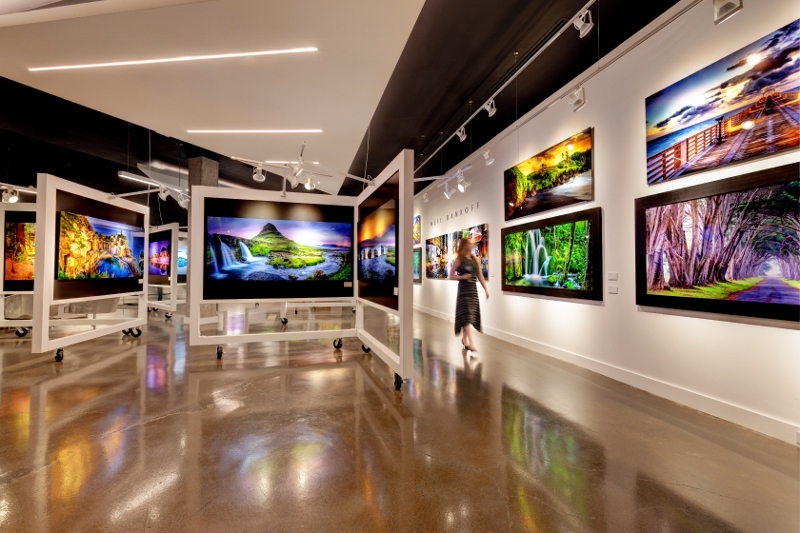 “There is an extra degree of satisfaction for me, when I think about my work being showcased in corporate environments, providing a much needed optical refreshment for many pairs of eyes every day. Hotel Designs is proud to support ARTIQ as it continues to recognise and celebrate fresh artistic talent. The Graduate Art Prize comes ahead of this year’s highly anticipated Brit List 2018, taking place on November 22 at BEAT London, which will name the top 75 most influential designers, hoteliers and architects in Britain. Main image credit: Felicity Meachem, I’m alright, hiding tonight. East meets west as Asia Week arrives at Design Centre, Chelsea Harbour. The exhibition, in association with Asian Art in London, is a multi-dimensional exhibition that will run from 5 until 9 November 2018. 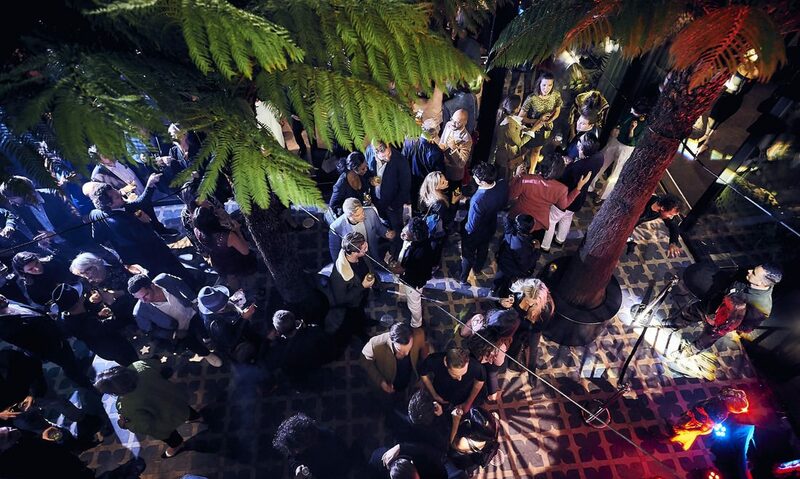 Attracting top designers, architects, international collectors, art-lovers and style-seekers, it will celebrate the influence of Asian art, culture and creativity from across the region. Featuring seven galleries showcasing the work of artists from China, Korea, Japan, The Philippines and Nepal, Asia Week at Design Centre, Chelsea Harbour will explore the enduring appeal of the Asian aesthetic and why it resonates today. Artistic interpretations of the history, philosophy and culture of individual countries will offer a unique perspective to the work on show. Design Centre, Chelsea Harbour’s famous architecture will provide a dazzling space for an impressive rollcall of emerging and established names. Work by Japanese artists will be represented by Kamal Bakhshi. These include those by the grande dame of Japanese printmaking Toko Shinoda; painter, printmaker and multi-media artist Daniel Kelly (his work can be found in permanent collections of the Museum of Modern Art New York, the Metropolitan Museum of Art and the British Museum) and renowned printmakers Morimura Rei and Yoshitoshi Mori who specialized in ‘kappazuri’ stencil prints. ArtChina, which represents Chinese printmakers and contemporary artists, will show a selection of artworks, prints and ceramics that combine traditional techniques with a modern aesthetic. They include woodblock prints by Wang Chao, screenprints by emerging artist, actor and producer Kelly Mi and lithographic prints by Wei Jia, a representative of artists born in the 1970s. From Korea will be ceramic pieces from The Han Collection including those by pottery painter Oh Man-Chu. The selling exhibition will include work by South East Asian artists, represented by Singapore Art Garret Gallery (SAGG), such as those by Singaporean watercolourists Ng Woon Lam and Don Low, renowned glass sculptor Ramon Orlina from The Philippines and Indonesian painters Indra Dodi and Hari Gita. The October Gallery will showcase contemporary work by Nepalese artist Govinda Sah, Chinese artist Tian Wei and celebrated Japanese artist Kenji Yoshida. Genrokuart will explore female beauty and the history of pre-modern Japan. Previously unseen in the UK, visitors can also view the Hugentobler Collection of Modern Vietnamese Art, featuring paintings and drawings by two Vietnamese modernist masters, Bùi Xuân Phái and Nguyễn Tư Nghiêm. It belongs to a private collector who discovered Hanoi’s hidden art scene when he travelled to Vietnam in the early 1990s as the country was opening up. The work is not for sale but has come from its current home in Switzerland, especially for the exhibition. The inclusion of the NIO EP9 supercar will quicken the pulse of design lovers and automotive collectors alike. The fastest electric car in the world, carbon fibre is coupled with advanced technology in the design of this high-performance vehicle from China-founded EV company NIO. With its futuristic aesthetic, the EP9 has the looks to match its performance. 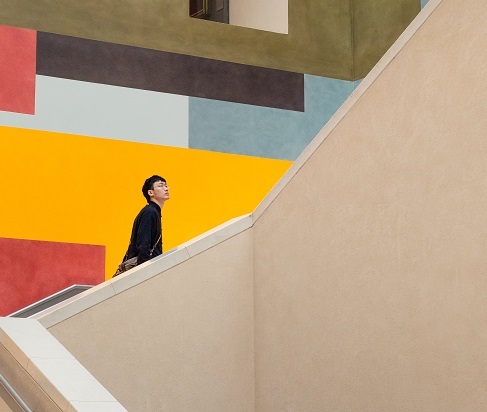 Generating a deeper understanding of design from both cultures is at the heart of the events programme, bringing a connection in an increasingly cosmopolitan world. From talks, workshops ad masterclasses and discovery tours, they will explore the crossover between East and West. As interior designers, hoteliers and architects prepare to attend this year’s highly anticipated Hotel Designs Brit List 2018, the editorial team at HD have been hard at work to pinpoint key interior design stories that are worthy of a place in this year’s list. One key area that has been a ‘make or break’ element in the applications we and our judges have read has been the clever use of art and photography. It seems, while many hotels from around the world are cutting their art budget, Britain’s best new hotels have a carefully curated selection of fine pieces that further layer a sophisticated sense of place into the property. Therefore, in order to give credit where it is due, here are seven sensational hotels who, unlike others, are using art and photography to stand out in order to claim their title as a leading art and design hotel. 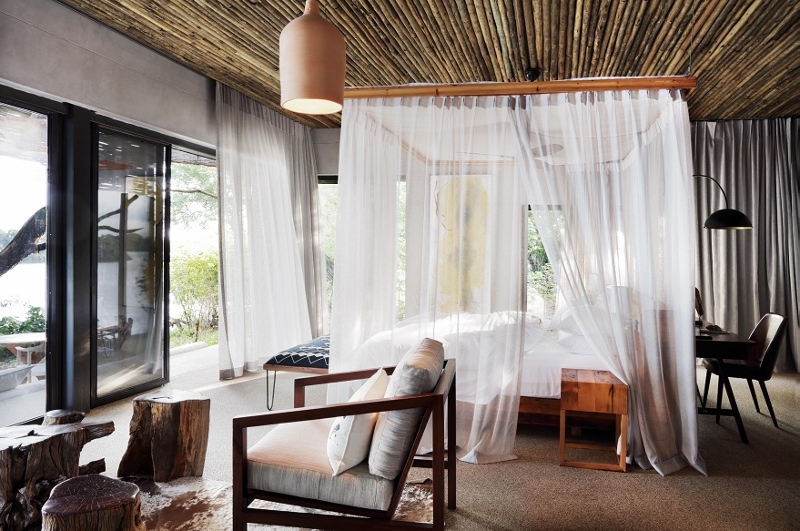 Our art and design journey starts in Zimbabwe, at the sumptuous and striking Matetsi Victoria Falls. Approximately 40km from the ultra colonial Victoria Falls Hotel, Matetsi is the premium way to experience Safari in the area. Creating an inspiring interior design story in a place where nature very much rules is a challenge for even the most experienced design houses. It is therefore a credit to the owner, John Gardiner, who put his faith in a local designer instead. 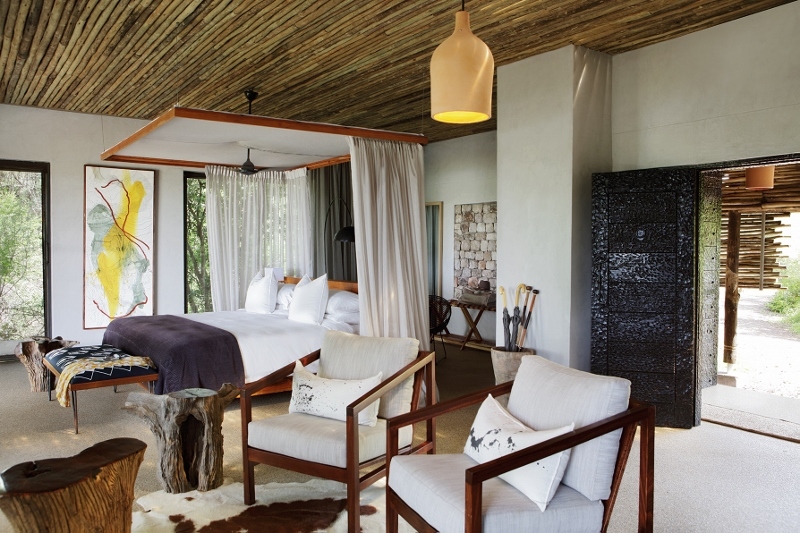 Kerry van Leenhoff was tasked to create the dramatic interiors that are also comfortable within the luxury lodges. Answering this question with style and a well-proportioned sense of place, Leenhoff decided to include an abstract piece of art with yellow accents in each of the 18 suites. Part of a wider story – of course – put all of these pieces together and there forms a map of the 123,000 acre reserve. The Telegraph reported that Leenhoff designed the spaces “to be a nature retreat, with every comfort and diversion one might dream of,” and I have to agree that the local designer that the owner believed in has done just that. Each of the the 30 rooms at New Majestic Hotel have been decorated in an individual style in collaboration with different artists and designers. 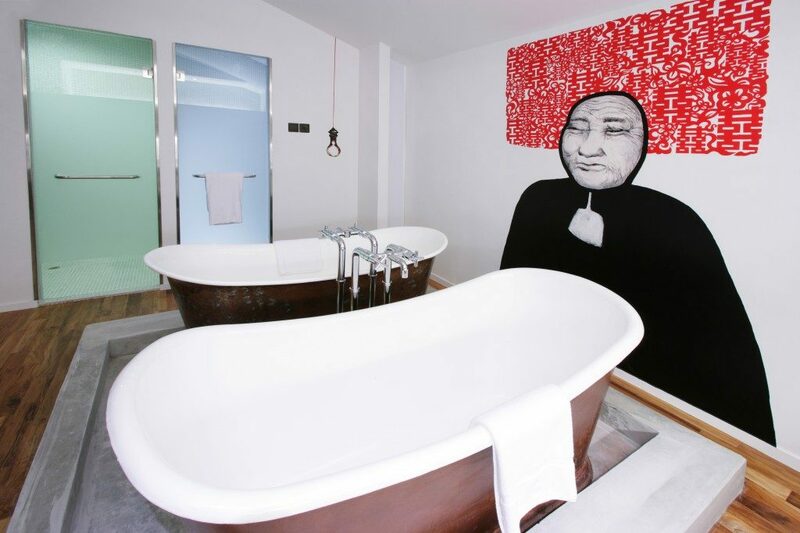 The hotel collaborated with art consultancy firm Asian Art Options, which selected nine Singaporean artists to create and integrate an element of local art around the hotel. In Room 201, guests will find the work of pop artist Justin Lee, who juxtaposes Asian and western motifs with Oriental Girls Go West. Lee explored commentaries on women’s standing in society. Elsewhere, Heleston Chew produced anamorphic messages that can be decoded only by viewing them from particular vantage points around the room. Safaruddin Abdul Hamid (aka Dyn) produced a mural depicting the façade of Hotel 1929 on the eight-metre wall of the gym. Miguel Chew integrated laser cut figures in polished aluminium, depicting sensual and romantic silhouettes that reflect the plays of light and darkness of the room. Other artists featured are Lee Meiling, Tay Bee Aye, Kng Mian Tze and Sandra Lee. Further east still, the Henry Jones Art Hotel in Tasmania doesn’t lack character as it is situated on Hobart’s waterfront in a converted row of former warehouses that date back to the 1820s. The hotel, which gives industrial-chic a more meaningful definition, shelters an ever-changing exhibition. It asks a diverse range of Tasmanian artists to present pieces. The result is more than 400 pieces of art and photography scattered around the property and a constant stream of creative individuals checking in to enjoy the vibrant atmosphere. A few weeks ago, we explored the concept: art outside the frame in the hotel. The Alexander redefines the art of hospitality by transforming every area of the hotel into a riveting space for commissioned works of art. 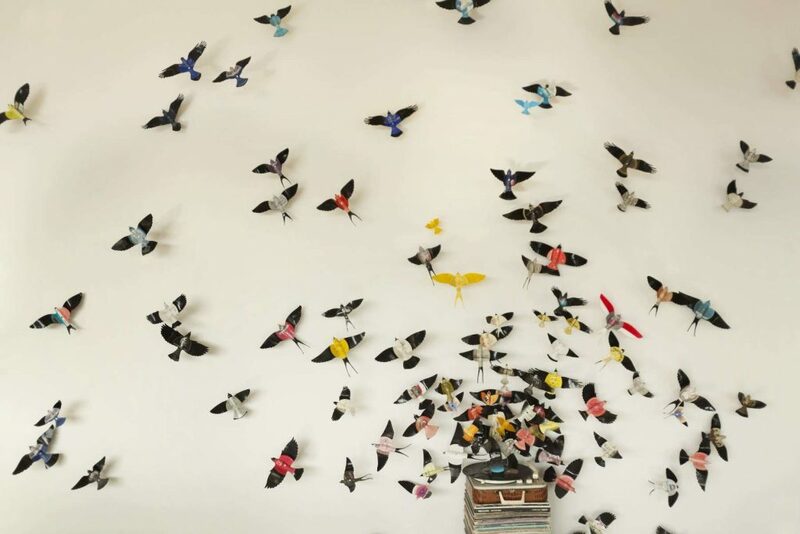 The lobby, for example, features a 3D wall installation of birds flying out of a record player. 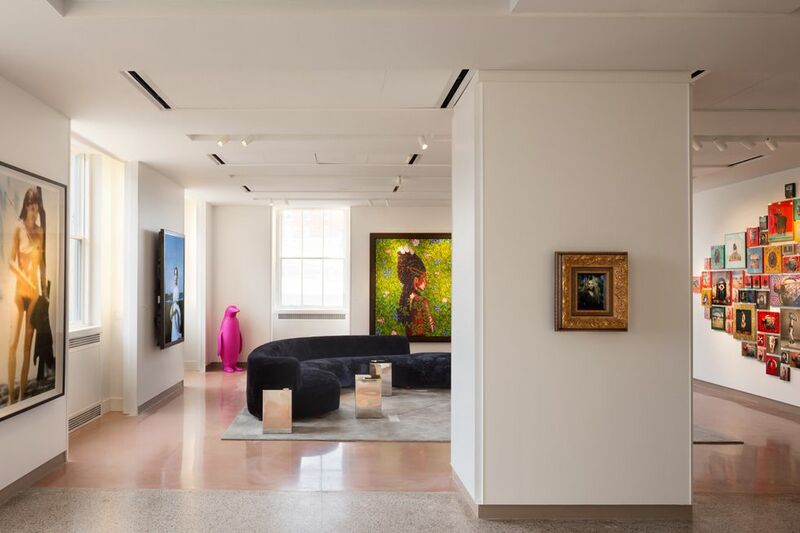 Founded by two contemporary art collectors, the Nashville-located hotel is, like the other seven hotels in the collection, centered around a multi-venue contemporary art museum — with exhibition space free of charge to the public. 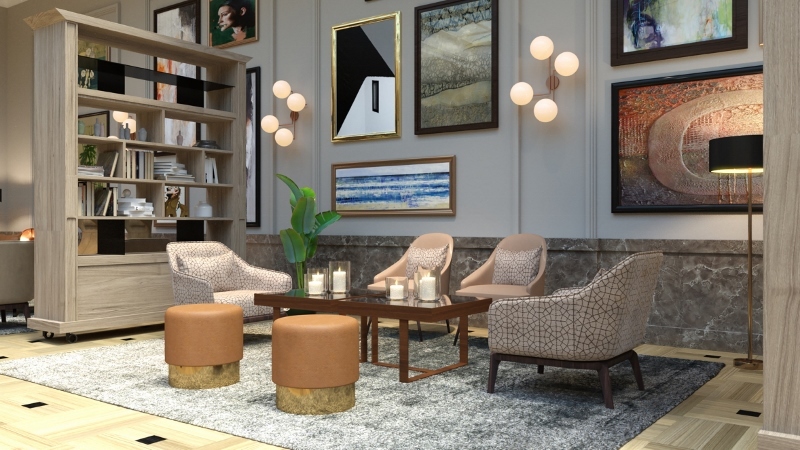 The hotel is woven into the fabric of downtown, welcoming both visitors and locals to enjoy the curated exhibitions, cultural programming, and culinary offerings at Gray & Dudley. Just a few blocks from Nissan Stadium, Bridgestone Arena, and the entertainment along Broadway, 21c is an art-filled escape from it all. Completing our tour of the globe to find inspiring art and photography hotels, we arrive in London, one of the major design hubs of the world – and for good reason. 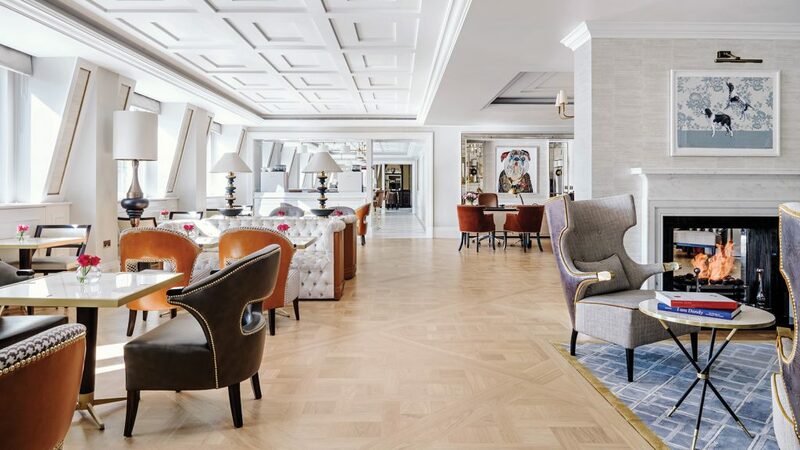 The Langham, London – and more specifically, the Sterling Suite and the Club Lounge, feature the perfect blend of quintessentially British art. Curated by Susan Walsh and Robin Greene, with the overall design overseen by Richmond International, the team worked hard to sensitively and effortlessly inject life into the interiors of these area with an abstract take on British culture. Next month, Hotel Designs will investigate how photography and artwork is used within international hotel design in order to create personality and a strong sense of place. 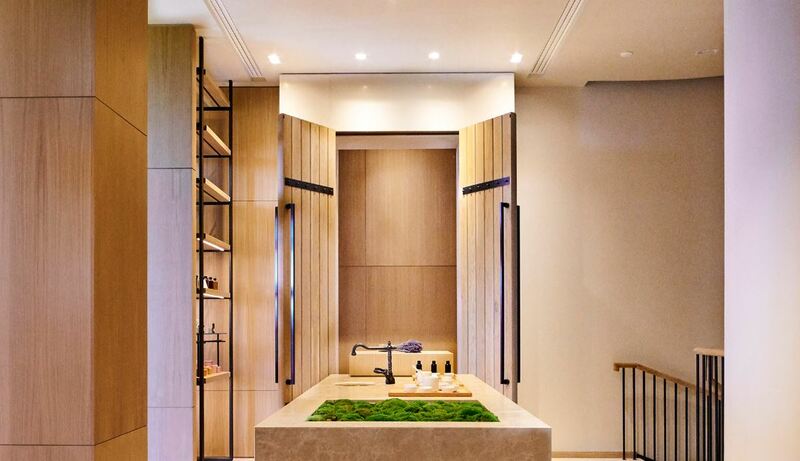 In addition, it will reflect on Show Season’s London Design Festival and Independent Hotel Show and will highlight what the industry can expect ahead of this year’s highly anticipated SLEEP + EAT. This month, ARTIQ will conclude its nationwide search to find the best young artists trying to make a name for themselves. Now in its sixth year, The Graduate Art Prize 2018, established by ARTIQ and global law firm Herbert Smith Freehills in 2012, is open to all final year students on BA and MA degree courses at British art colleges or universities. 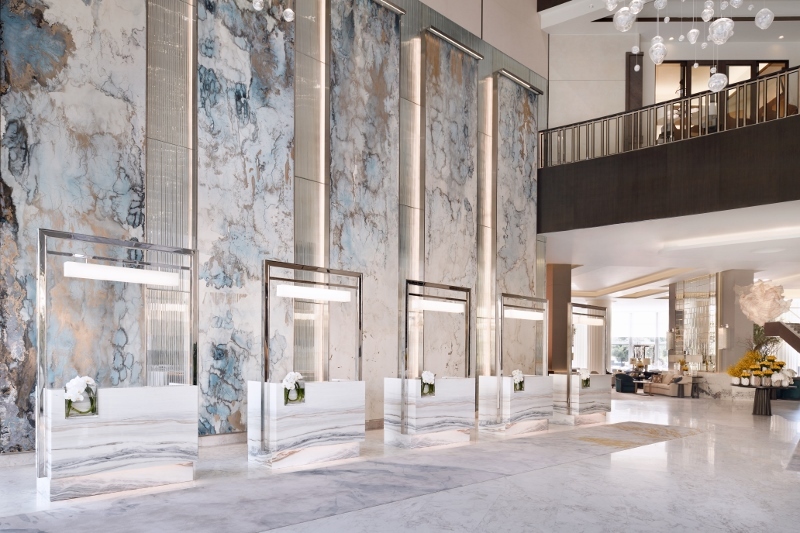 In addition, the Hotel Designs editorial team will catch up with the artist behind the sensational newly designed lobby at Address Downtown, Dubai in order to understand the challenges of creating the 8.5-metre-high paintings that now frame the luxurious first impressions upon arrival. 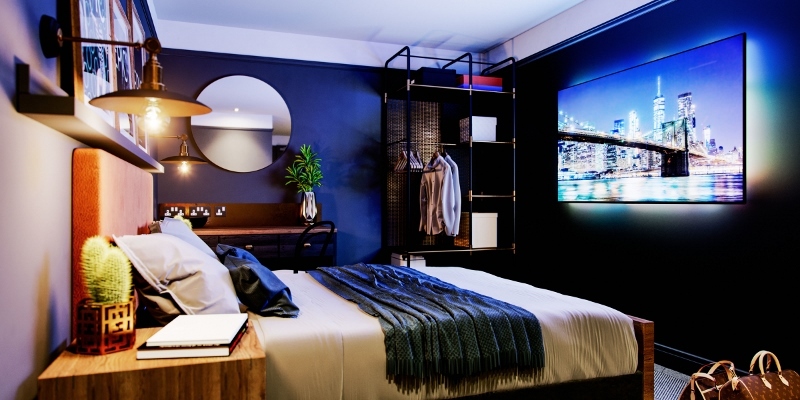 As we hit the halfway point in regards to Show Season as the industry prepares for SLEEP + EAT, Hotel Designs will reflect on the highlights from both London Design Festival and Independent Hotel Show in order to pinpoint the main events and what the trends look like for 2019 and beyond. If you’re a supplier in either of these categories and want your products to reach more than 41,000 hoteliers, interior designers and architects per month, there are plenty of ways you can get involved with these features next month, from supplying an opinion piece to working with us on a targeted mini-series. The shortlist for The Graduate Art Prize 2018 has just been announced and public voting is now open. 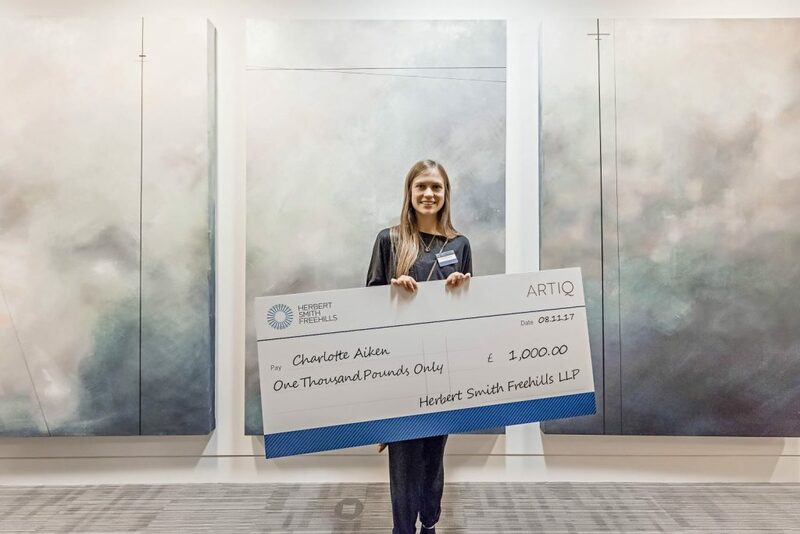 ARTIQ is delighted to announce that this year The Graduate Art Prize features its largest-ever prize for the winner, thanks to the generosity of both new and existing sponsors, with a £2000 cash prize offered by global law firm and long-term sponsor Herbert Smith Freehills and an additional art materials voucher to the value of £500 offered for the first time this year by new sponsor Atlantis Art Supplies, with the £500 voucher also offered – and also for the first time – to a runner-up. Art consultancy ARTIQ, whose brainchild the event is, will also sign both the winner and runner-up to its roster of new and established artists, with possible representation also available for the other shortlisted artists. The increasingly influential award, now in its sixth year, is open to all final-year students on BA and MA degree courses at British art colleges or universities. The shortlisted entries were selected by ARTIQ, together with Herbert Smith Freehills and the winner and runner-up will be announced this year at a Private View on November 1st at the London offices of Herbert Smith Freehills by John Corrie, Partner at Herbert Smith Freehills, together with ARTIQ CEO Patrick McCrae. Voting on the shortlist is now open to the public, with the final prize-winner selected exclusively from the 23 finalists as a result of this vote. People are encouraged to vote for as many artists and works as they wish via clicking here. Art consultancy ARTIQ works with interior designers and architects, as well as directly with corporate, hospitality and developer clients to promote the use of art in the workplace and in hospitality and residential environments, through carefully-curated art collections on a sale, rental, exhibition or bespoke commission basis. The consultancy and its young, connected team, believes passionately in investing in and supporting new talent and in helping young artists get a foothold in the industry and being able to make a living from their work. Hotel Designs will be following all the action from the awards closely, and Art and Photography will become a major theme that will run throughout the month of November. Partnering with internationally renowned photographer, Terry O’Neill and legendary photography archive, Iconic Images, the series of artwork will bring to life the site’s rich musical history and immortalise the world’s biggest music and culture icons. Cult photographer O’Neill has shot countless global music and screen icons, with his work hanging in national art galleries and private collections worldwide. 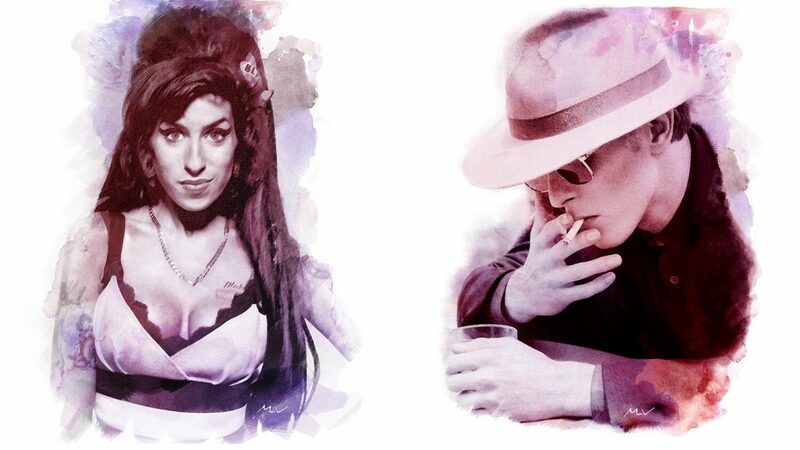 The collaboration will see Hard Rock Hotel London guests discover unique images of iconic musicians including Amy Winehouse and David Bowie, embellished with bold brushstrokes of colour by the artists at Iconic Images. 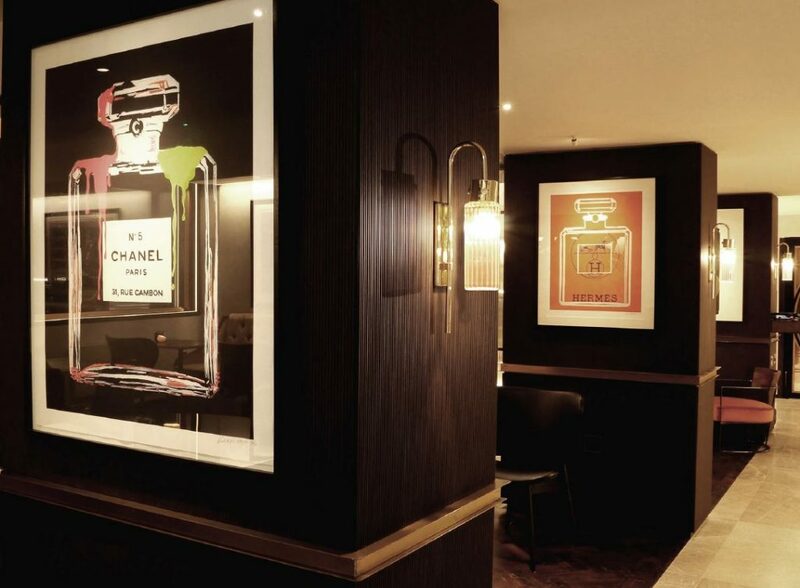 Exhibited across all of the hotel’s suites and bedrooms, the artwork will be a visual homage to the biggest names in the industry, many of whom have previously stayed at the property in years gone by. Joining Winehouse, Hendrix and Bowie on the hotel walls will be Elton John, Diana Ross, Madonna and Mick Jagger. Internationally recognised as a world-class entertainment and lifestyle brand, Hard Rock Hotels offer stylish, contemporary, design and unparalleled service with the continual thread of music running throughout. Hard Rock Hotels’ current portfolio is located in the world’s most enviable resort destinations, as well as urban gateways. Hard Rock Hotels cater to the evolving and distinctive needs of today’s cosmopolitan travellers who seek a reprieve from traditional, predictable experiences, whether for business or leisure travel. 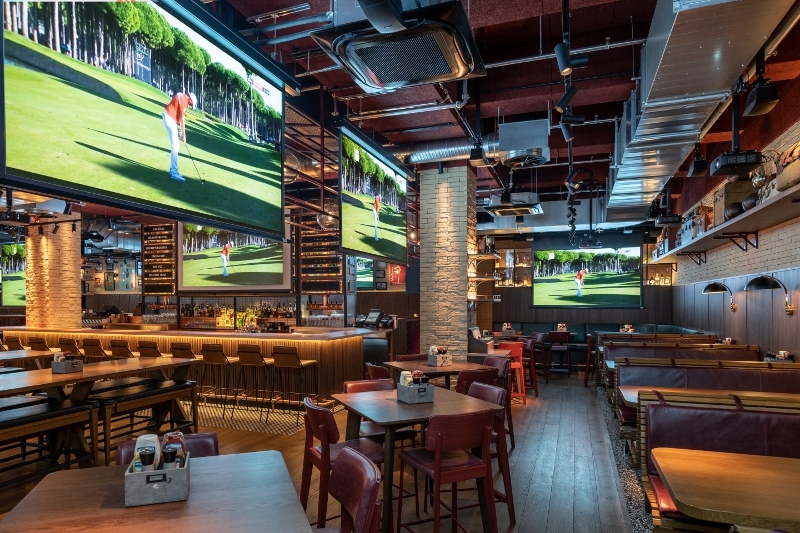 Hard Rock Hotel’s arrival in London will further help define the hotel group as one of the most iconic and most recognisable companies in the world, with venues in 74 countries, including 185 cafes, 25 hotels and 12 casinos. Beginning with an Eric Clapton guitar, Hard Rock owns the world’s greatest collection of music memorabilia, which is displayed at its locations around the globe. Watch out London, Hard Rock has announced its grand, solo entrance. Known for its wildly mysterious bohemiam-gothic design, The Mandrake in London’s Fitzrovia district has announced that the high priest of Hollywood tattoo artists, Mark Mahoney, will be the artist-in-residence between September 20 – 30. 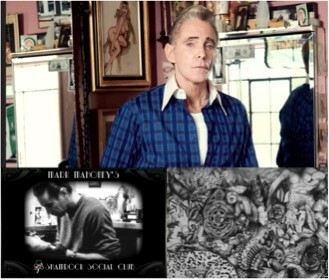 From September 20, Mahoney – whose roster boasts A-listers including David Beckham, Lady Gaga, Adele and Johnny Depp – will bring his Shamrock Social Club tattoo parlour to The Mandrake for ten days only, where he will live-ink his VIP guests. In-house guests at The Mandrake can skip the 18-month waiting list and request to be inked by the legend himself. In addition to the West Hollywood Shamrock Social Club inspired pop-up, The Mandrake will offer 15 lucky fans an opportunity to have an immersive private charity dinner with Mahoney. Shamrock tattoo parlour pop-up, 20th – 30th September: Guests can see Mahoney in action from the hotel lobby and courtyard in a space inspired by his West Hollywood studio. In-house guests of The Mandrake will have a once-in-a-lifetime opportunity to be tattooed by Mark himself, jumping the epic 18-month-long waiting list. To be in with a chance of this, guests of The Mandrake should request a tattoo by emailing tattoo@themandrake.com. Wine and dine with the legend himself, Wednesday 26th September: The Mandrake is offering 15 lucky guests the rare opportunity to meet Mahoney at an exclusive charity dinner where the strong-browed, pompadoured Mahoney will share his celebrity tales of the last 40 years and possibly inspire guests to immortalise the night in ink on their next trip to Hollywood. Tickets will be priced at £500 with some of the proceeds going to a cancer charity. Contact tattoo@themandrake.com to be in with the chance of attending this five course dining experience, equipped with Mahoney-inspired cocktails and goodie bags. Johnny Depp calls him brother. Lana Del Rey cast him as her muse. Beckham is head to toe in his work. Mark Mahoney is revered by fellow tattoo artists, and the younger generation look to him as an inspiration and mentor in the craft of tattooing. His work has revolutionised tattoo inking globally and The Mandrake will once again welcome the legend as part of the hotel’s Artist-in-Residence series for September. 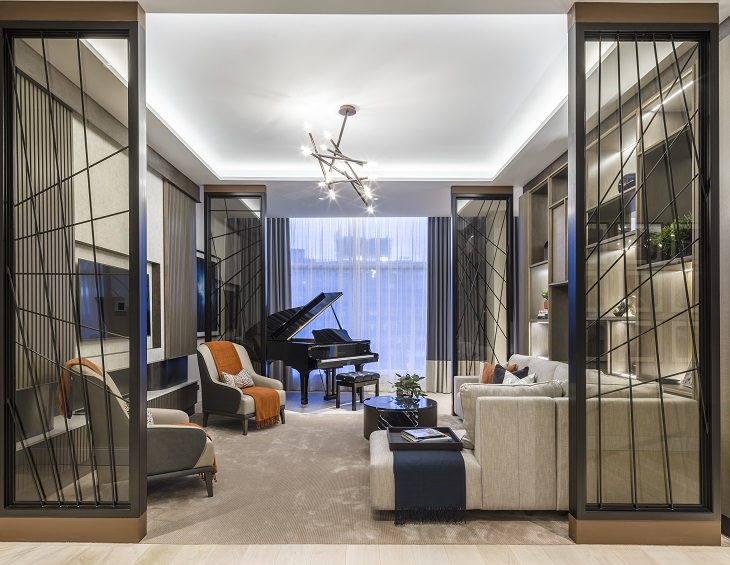 Following the recent completion of the Pavilion Suites at the Berkeley London, designer André Fu continues the notion of ‘’Modern Reflections’ with four key openings which will be unveiled later this year. With an extensive portfolio of projects throughout Asia and Europe, the studio has been pivotal in revolutionsing the concept of modern luxury with a series of projects that reflect Fu’s signature artistic perspective and timeless sensibility. His latest projects reflect just that. Situated halfway between the historic town of Aix en Provence, home of Cezanne, and the famous Luberon Nature Park, Villa La Coste is set in the midst of the Provencal landscape, in the heart of the biodynamic vineyard Château La Coste, an international destination for art, architecture and natural beauty. 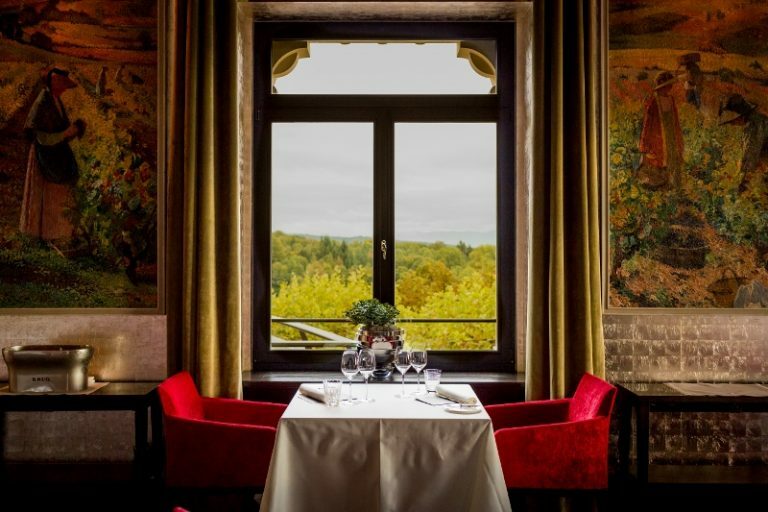 Inspired by the spirit of the vineyard and breath-taking artistic vision of the chateau, Fu designed key destinations within the hotel, including the restaurant Salon, the Bar and the Library. 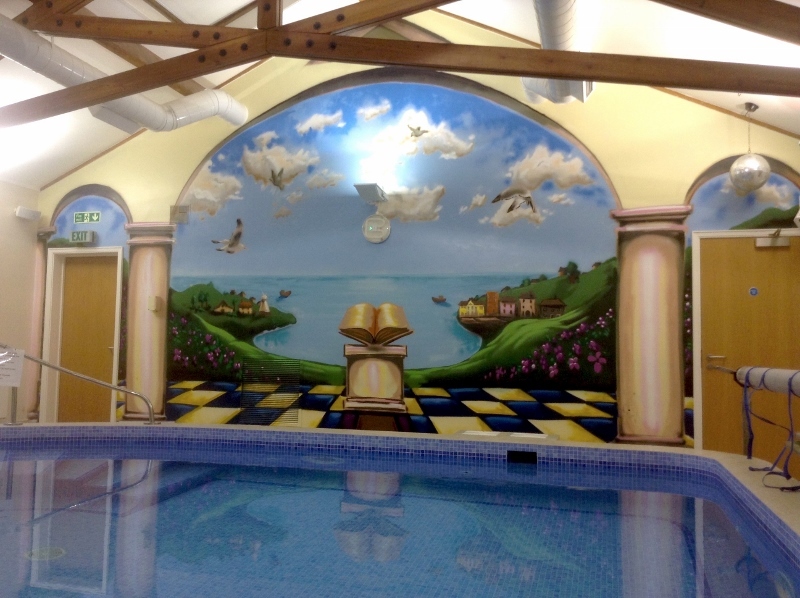 This summer sees the opening of the much anticipated spa. To create the spa, Andre used rustic Cipria marble, brushed silver oak and plastering finished in the local Provencal manner, layered with Fu’s signature style of contemporary, elegant luxury. Conceived as an emotional journey, guests are transported into a distinctly rustic yet contemporary world. 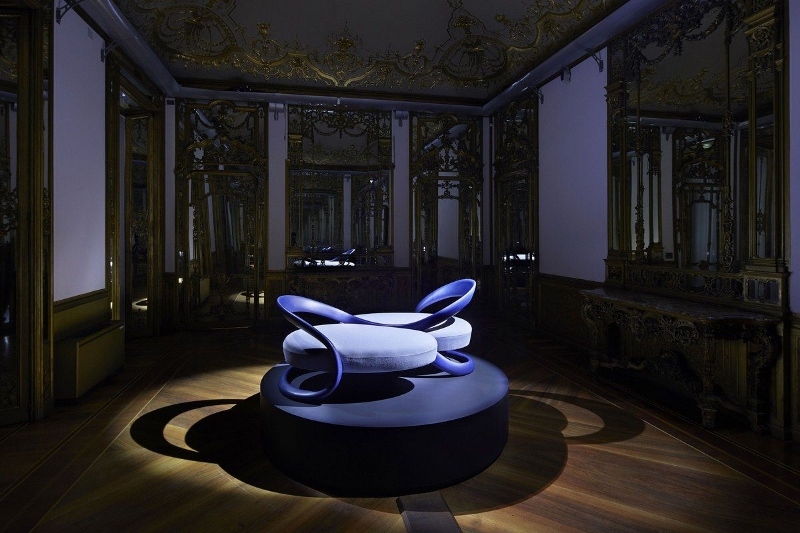 For Louis Vuitton Objets Nomades exhibition during Salone del Mobile, Andre Fu presented Ribbon Dance, a two-person “conversation” chair which is a graceful echo of the movements of traditional Asian ribbon dances. The pair of seats are balanced between the elegant curves of the wooden arms which are covered in Louis Vuitton leather while the fluid shape of the chair evokes ideas of infinity. Ribbon Dance was first shown in Hong Kong in March this year, in a stunning exhibition space designed by Fu, which featured other Objets Nomades. Created in 2012, the Objets Nomades collection keeps alive Louis Vuitton’s long tradition of beautifully crafted travel objects. Hong Kong’s waterfront and stunning harbour have always served a key inspiration for many of Fu’s creations. Following his timeless design for Upperhouse hotel that ushered in a new era of hospitality, and the Kerry Hotel that follows an urban resort concept, Fu has created two signature restaurants at the Hotel VIC, offering a duo of dining experiences on the city’s distinctive harbour front. Inspired to capture the spirit of an authentic farmhouse, the Farmhouse is an all-day international dining venue, located atop the podium to offer delicious buffets and international cuisine. The dining room features a dramatic open kitchen, while a lush outdoor garden creates a very special backdrop for al fresco dining. Adjoining the restaurant is The Farmhouse Deli, a 4m high delicatessen decked in interlocking walnut and highlighted with a grid of brass fins to evoke an urban vibe. A bespoke island communal glass table and a range of lounge seating have also been introduced to embrace a co-working environment. Set within the modern Magnolias Ratchadamri Development in the upscale Phatum Wan district, the Waldorf Astoria’s contemporary interior has been designed by Fu, evoking the Waldorf’s rich Art Nouveau heritage, but overlaid with his own contemporary design ethos, presenting extravagant ceiling heights, traditional Thai elements, bronze accents and other inspired touches. 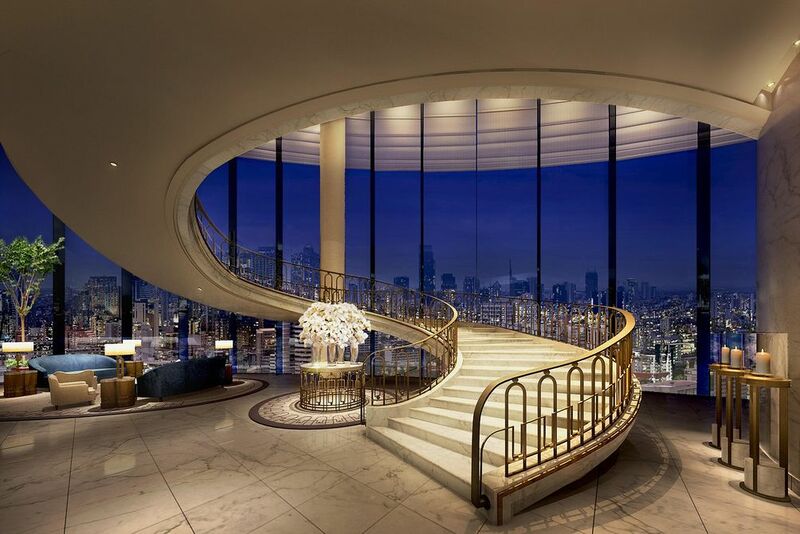 For Fu, The Waldorf Astoria Bangkok exemplifies his concept of ‘modern reflections’, stating “it is very much a reflection of my personal memories of visiting the legendary Waldorf Astoria New York as a child and my vision to translate the essence of the experience into the context of modern Bangkok today”. Fu has also created three unique dining venues, including The Front Room, providing a menu of Nordic/Thai cuisine, the hotel’s signature Peacock Alley lounge and the Brasserie. A four-tiered tower dedicated to banquet facilities has also been introduced. Meanwhile, the guestrooms boast floor-to-ceiling windows, hand tufted rugs covering hardwood floors, and Thai-inspired details. Fu has a long-standing collaboration with renowned gallerist Emmaneul Perrotin for his artspaces. Following the success of Fu’s collaboration with Perrotin for two key spaces in Hong Kong and Tokyo, AFSO has been commissioned to create the new gallery for Perrotin in Shanghai due to unveil late 2018. 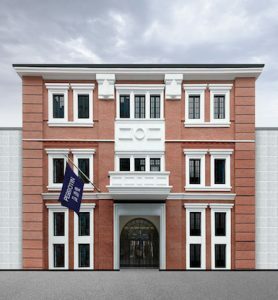 Located in the heart of Shanghai’s Bund quarter, this will be the 18th gallery space that its owner Emmanuel Perrotin has opened worldwide in 28 years, Perrotin Shanghai will occupy the top floor of a historic three-storey brick building (27 Huqiu Road) known as “Amber Building”. Built in 1937, it is a former warehouse used by the Central Bank of China during the Republican period. From 1886 to 1943 Huqiu Road was named “Museum Road”. It continues till this day to have a prominent place in Shanghai’s art landscape with its close proximity to the city’s major museums and auction houses including Rockbund Art Museum, Fosun Foundation and Christie’s. The 1,200 square meter gallery space will include a mezzanine and several exhibition rooms. In keeping with the building’s modernist elegance. Camden-based wallcoverings company Rock Roll has launches the world’s first officially licensed repeat wallpaper and large-scale murals of album artwork from seminal recording artists. 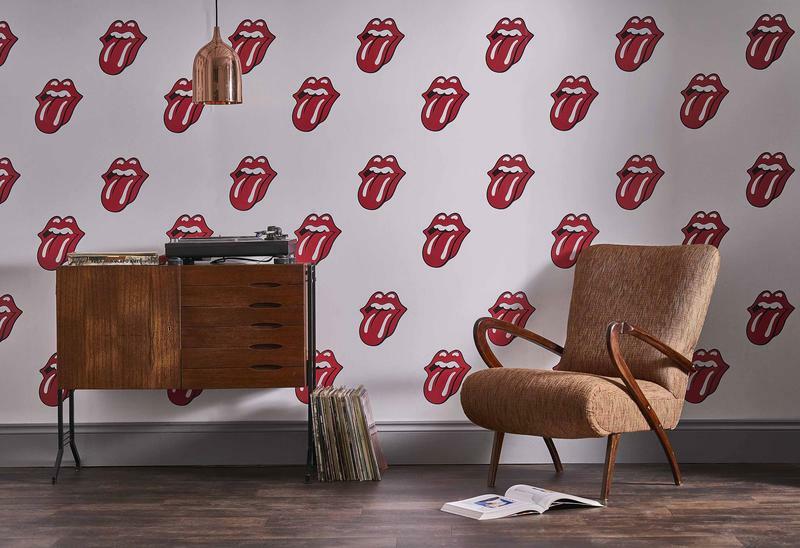 Delivering superior quality bespoke wallcoverings of legendary bands Rock Roll will transform rooms into statement spaces that speak to aficionados of quality and music. Working closely with band management, record labels and the artists personally, Rock Roll has obtained the official rights to reproduce cover art on high-quality, digitally printed bespoke wallpaper and murals. A passionate group of music enthusiasts, Rock Roll has worked with artists and record labels for years. For that reason, it does things properly – every design is officially licensed and fully approved by the artists and their management. Art and design play a central role at Naumi Auckland Airport, which opened in February. Already heralded as the world’s coolest airport hotel, making it into Forbes’ list of “The Best Airport Hotels In The World 2018”, Naumi Auckland Airport is a living gallery as well as a hotel. Its impressive work embellishes the property from the entrance through to each and every guestroom. From up-and-coming artists in New Zealand as well as established names internationally, the multi-sensory pieces reference the native Tui bird, on which the hotel’s design is centred, as well as the beautiful landscapes of the country. One of the most striking works at Naumi Auckland is found in the lobby. 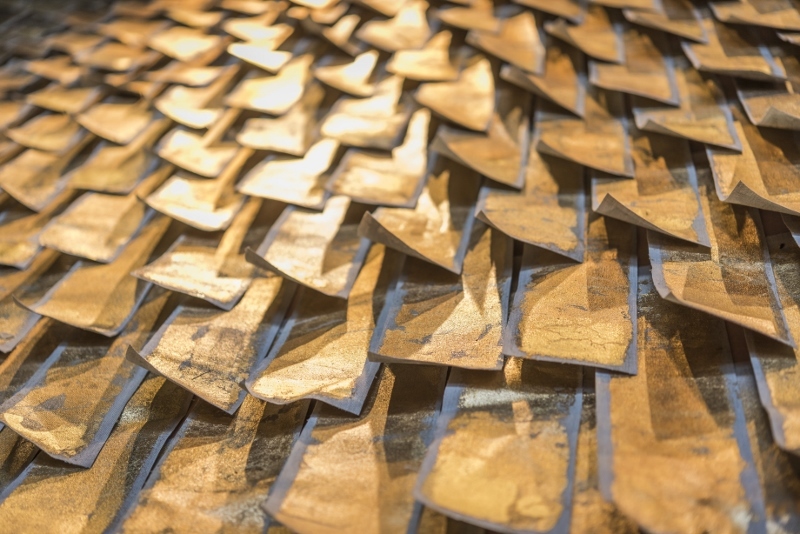 Greeting guests as they arrive is a 24-carat gold textured wall which represents the feathered nape of the Tui bird. Commissioned to the NY Art Department (New Zealand), the 95 gold discs are hand painted with a feather pattern. Next to the wall sits a customized two and half metre bird cage as well as paintings from Australian artist Belynda Henry. Winner of the SNW Wynne prize, Belynda was specially commissioned to capture the natural Auckland landscape and started the process by sitting on the rooftop of the hotel to sketch the view. Her original pieces have been transformed onto rugs in the guest rooms as a playful interpretation of the Tui bird’s native surroundings. The rugs allow guests to engage with the natural landscape through a walkable piece of art. Among the eclectic mix of handpicked furnishings from the likes of Jonathan Adler and Kartell are works by New Zealand based designer Judi Bagust. Commissioned to work on original pieces for the hotel, the artist chose to capture the lyrical notes of the singing Tui bird. The largest work is found in the Paksa Restaurant as well as prints hanging in the guestrooms, complete with customized brass frames. Seemingly floating in space, Bagust’s brushed ink marks stretch, loop and fold across the paper in one elegant, oscillating movement. Each mark twists and turns to give the effect of a delicate dance of a geological form or musical score. In keeping with the hotel’s art theme, Naumi Auckland is home to two design suites including the Dotty Suite, inspired by the Japanese artist Yayoi Kusama, known for her brightly coloured conceptual pieces. Each piece of furniture, wall and soft furnishing will be inspired by Kusama’s signature dots, making it a one of a kind experience for guests. Naumi was the sponsor for Auckland Art Gallery’s Obliteration Room by Yayoi Kusama Project, that ran earlier this year. Project is the third ARTIQ has completed with Anita Rosato Interior Design and Marriott. 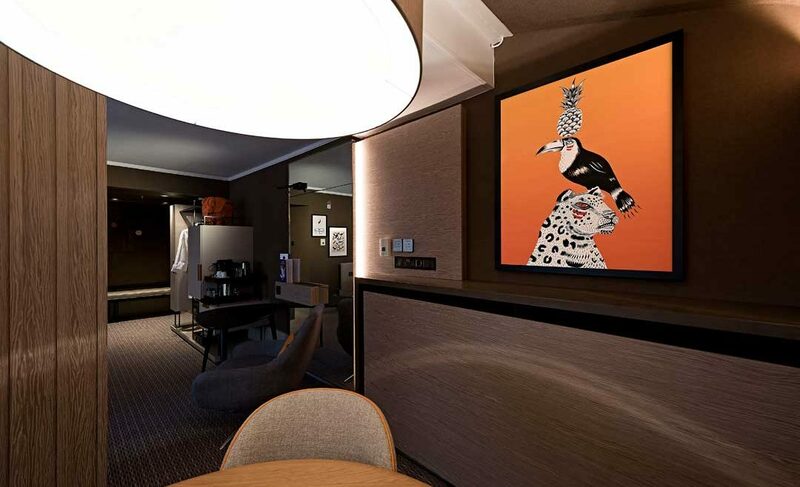 Art consultants ARTIQ have worked with Anita Rosato Interior Design on the curation of a location-specific art collection for London Marriott Hotel Regents Park, based on a zoological theme. 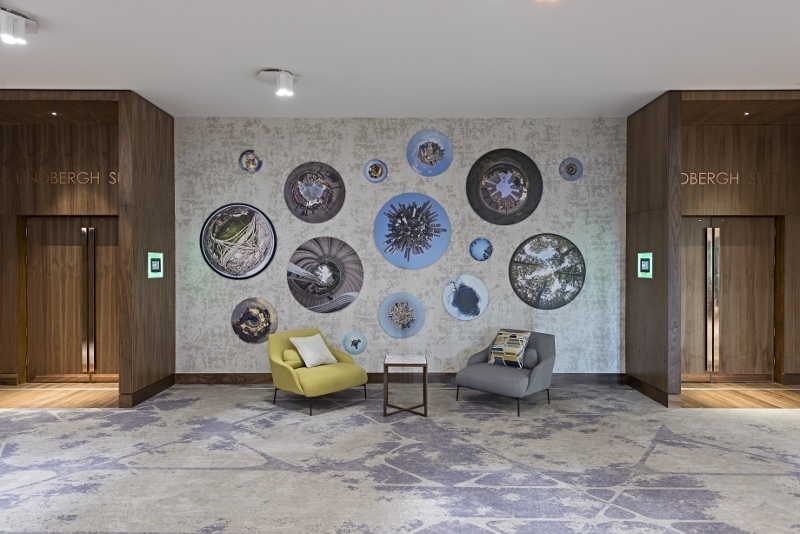 The project is part of the hotel’s multi-million pound renovation scheme and represents the third ARTIQ has completed with Anita Rosato Interior Design and Marriott, following previous collaborations on both London Heathrow Marriott hotel and London Marriott Hotel Maida Vale. For the Regents Park, ARTIQ worked with the overall project team, which also included Tower Eight, Benjamin West and the hotel operating team, to develop a new and bespoke art collection that would complement the hotel’s high-end redesign, as well as reflecting the hotel’s proximity to Regent’s Park, ZSL London Zoo and to the former villages that make up the wider area. 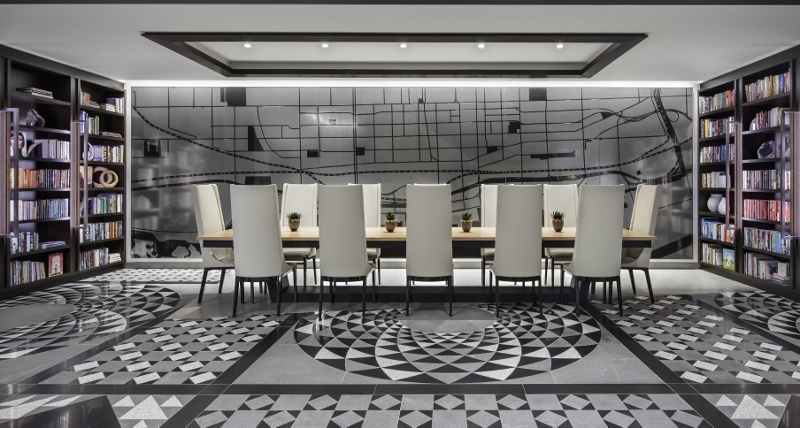 The full redesign remit covered the lobby, executive lounge, meetings and events spaces, as well as new and existing bedrooms, with ARTIQ’s area of work concentrated on the guestrooms, linking corridors and lift lobbies. For the latter, ARTIQ, under the direction of Head of Operations Katie Terres, says it drew inspiration from the natural surroundings of Regent’s Park and nearby Primrose Hill, procuring a series of botanical photographs that include reflections of the ‘Primrose Flower’. 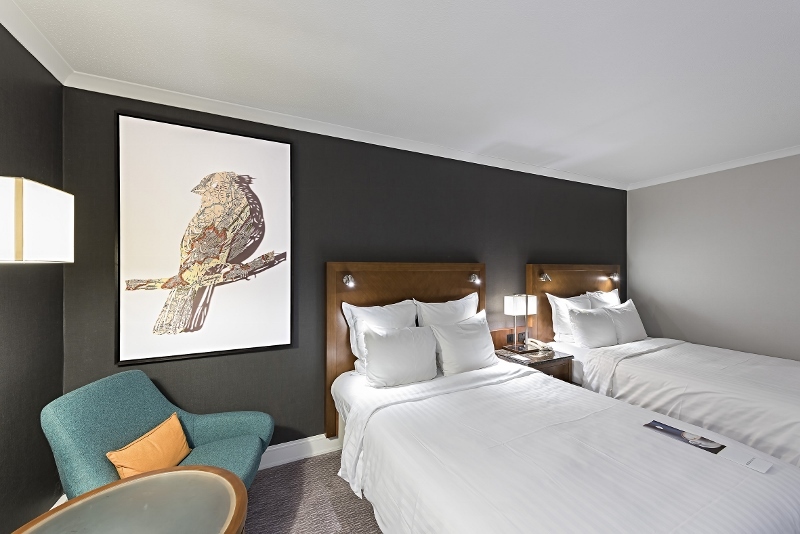 ARTIQ also procured a series of original prints by local artists with zoological themes for the guestrooms, including work by local artists Nadia Taylor and Joanna Ham, both of whom had been initially selected for the project by Anita Rosato Interior Design. 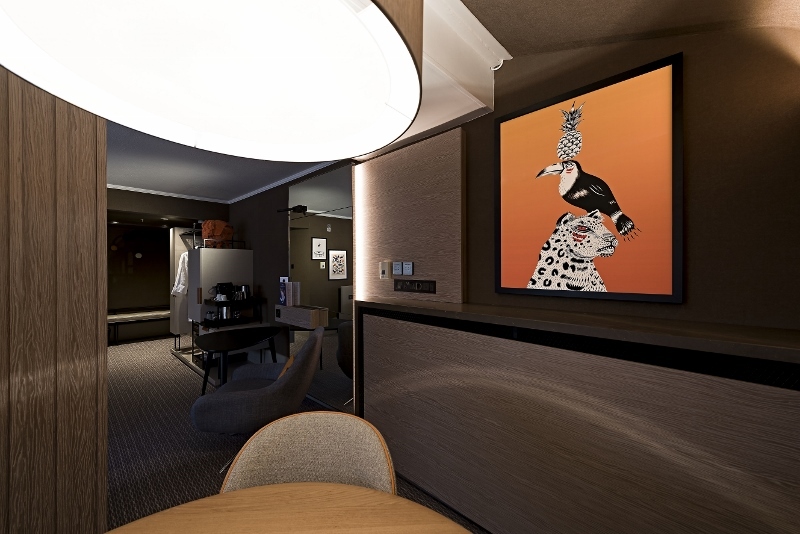 “On Anita’s recommendation, we commissioned Nadia to create new interpretations of her iconic bird collages, working with the artist to develop the pieces of art using bespoke colour schemes to complement the interiors,” said Terres. Work by artist and illustrator Joanna Ham is focused around animal motifs, with the character ‘Rabbit’ taking centre stage in her minimalist aesthetic. 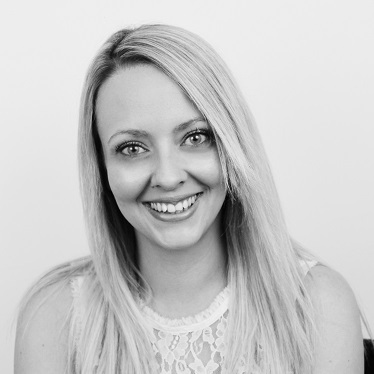 Joanna is the founder of London design house HAM and is a significant figure in the local contemporary art and design scene, having collaborated with brands including Liberty, Designjunction, Mother, Billy Name, Topshop and Colette. “Joanna’s work tallies with the hotel’s commitment to local artists and adds a contemporary splash of monochrome to the bedroom design,” Terres explained. 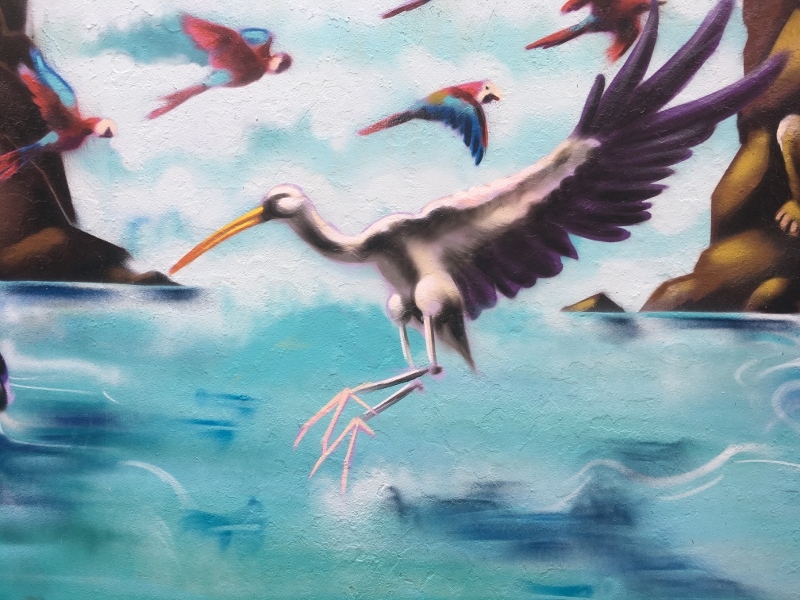 Additionally, ARTIQ directly commissioned Tropicana, by London-based painter and illustrator Margaux Carpentier, whose previous works include murals for ZSL London Zoo. The piece is a vibrant, playful depiction of tropical animals, with Margaux’s use of vivid orange in Tropicana complimenting the palette and orange detailing of the scheme’s interior by Anita Rosato Interior Design. 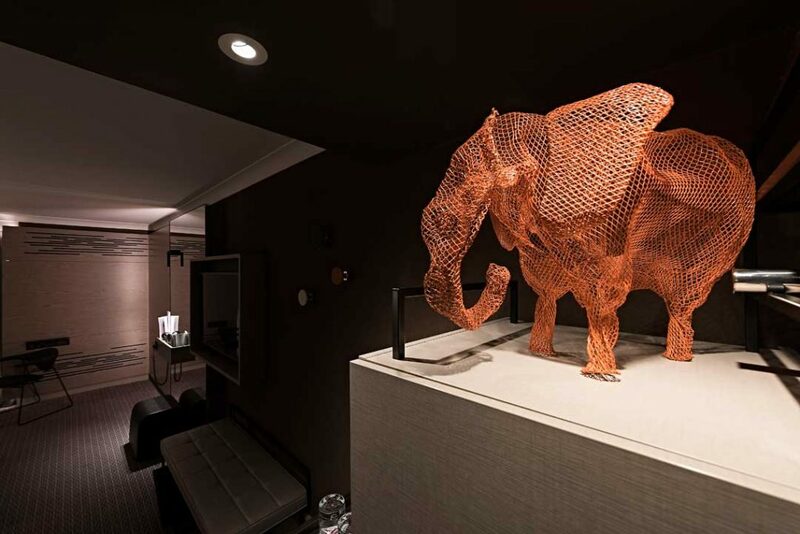 Anita Rosato Interior Design also created a sculpture for the guestroom art collection: a bespoke wire elephant sculpture, which ARTIQ then templated and commissioned for manufacture. The sculptures are intended to create a sense of fun and provide a playful focal point for guests. Some of the world’s best hotels double as art galleries. Mapplethorpes, Dalis and Warhols are peering down at guests as they check in. In some cases, owning major artworks is a status symbol: a sign of wealth. 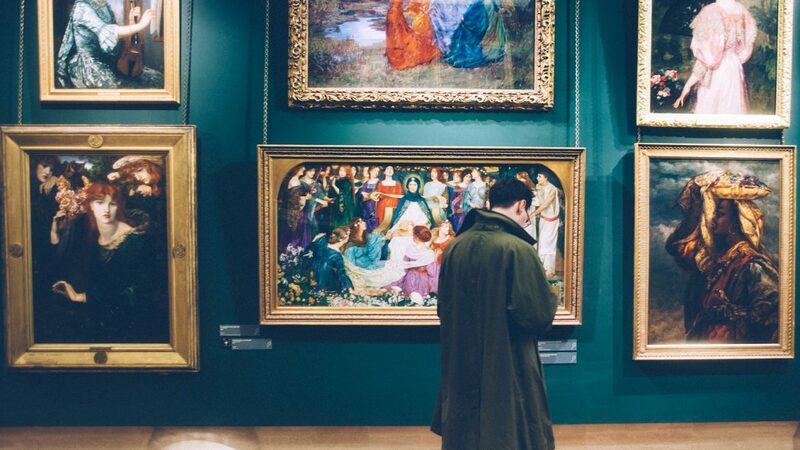 But hotels increasingly have a interest in visual art because it suggests a much-craved link with the local community, and exhibits a keenness for culture. Guests are increasingly craving personalised travel experiences. So incorporating visual art into a hotel’s interior design has become an obvious route to market. The new unstoppable trend. Art splurges personality, but the first step is never to rush into anything, says Fresssh Image architect and interior designer Giada Schioppa. “I always prefer to be surprised by an original by an unknown artist than see a print of Manet’s Déjeuner sur L’Herbe, or the Mona Lisa!,” she confesses. 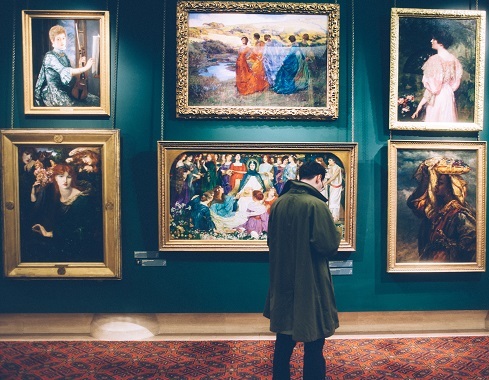 It’s true that an influx of hotels using art as a commodity has led to decrease in quality. 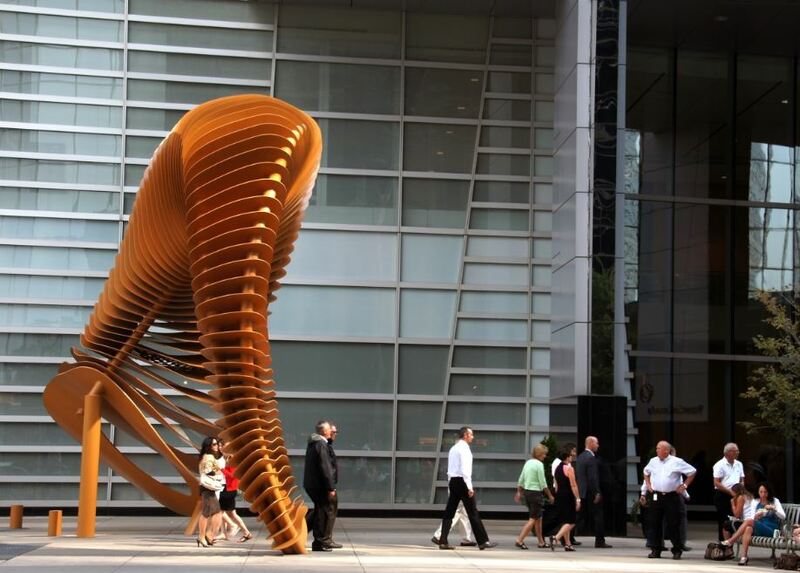 “In the last 10 years art as a trend has become quite common,” adds Giada. “From boutique hotels to bigger international chains, every brand is trying to differentiate their style to ensure their guests feel as though they’re in a truly unique place”. But when done well, art has no better home. “Visual art in hotels and public spaces influences visitor’s first impressions, and sets the tone,” comments Hallam Smith of innovative light specialists, Pulsar Light. The trend for personalisation, authenticity and ‘unique’ travel experiences has been helmed by boutique giants Airbnb. Now that staying in a stranger’s house and routing through their possessions has become the new travel must-have experience, hotels must follow suit. Demands for rich, authentic experiences are felt not only by hotel guests but by hotel suppliers. “Sensitive deployment of artwork pieces within a hotel environment enriches the guest’s experience by providing emotional resonance, a sense of individualism and personality,” chimes Richard McCready-Hughes, creative director of the Goddard Littlefair interior design group. Patrick McCrae, CEO of ARTIQ agrees. “Travelers today are looking to immerse themselves in local culture, meet people and learn about the societies they’re visiting. 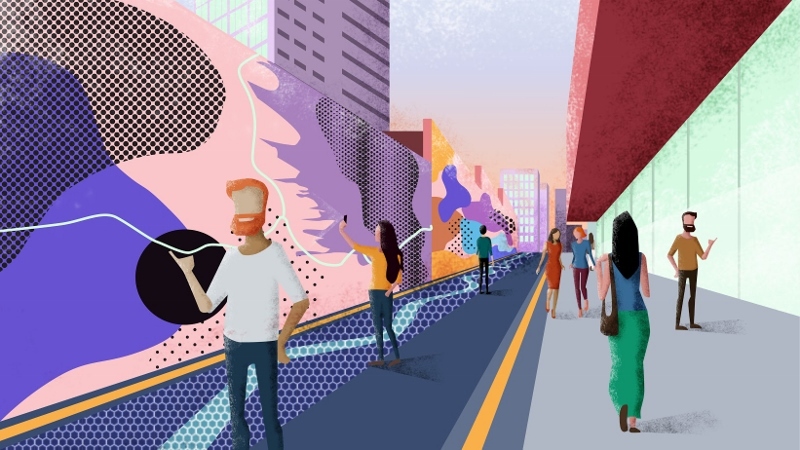 People are increasingly seeking an authentic connection to the places they visit. By having an art collection and an engagement programme, a lot of our hotel clients are helping facilitate that through art”. Patrick surmises that art is only one part of a wide push for authenticity. “This long-term trend sits alongside the desire for people to shop with local small businesses, drink local wine and eat local food. It’s about real, individual and meaningful interactions,” he suggests. For the hotels themselves, hanging visual art, and incorporating it into a hotel’s interior design, is a tremendously validating experience, and adds a generous dollop of clout. “Hotels understand that what graces their walls is something that can stand them apart from their competitors,” says Lydia Cowpertwait, curator at Dais Contemporary art consultancy. “Originally hotels would purchase artworks from manufacturing companies who would produce artwork en masse. Now, hotel owners are being more discerning about what goes onto their walls”. “A particularly effective idea is to refresh artwork every couple of months and ask local artists to exhibit their work,” muses Giada Schioppa. “Of course, there are some risks in doing that, as the brand could lose its consistency of style, but most of the time it satisfies the most curious of guests”. 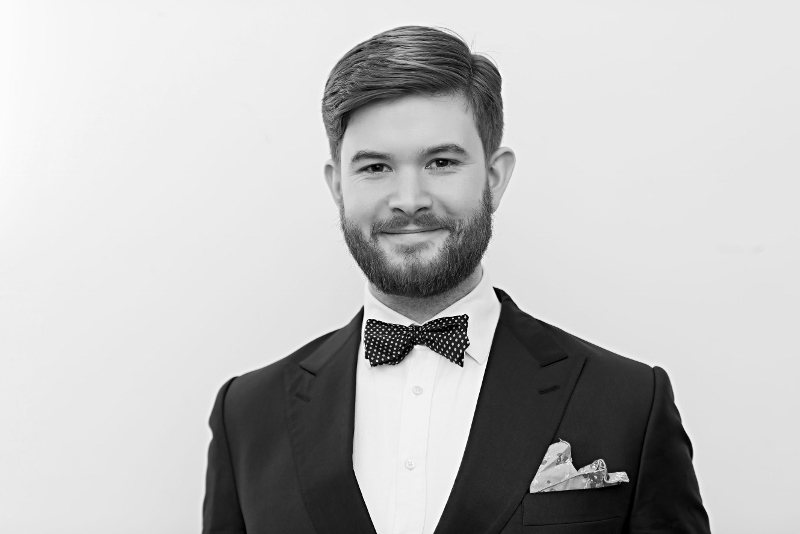 “If ever a hotel showed how to use art to create a point of view it was the original Morgans Hotel in New York,” says Simon Willis, brand director of Principal hotels. “As you walked into one of Andree Putman’s pristine rooms you heart would leap to see an original Mapplethorpe on the wall – it got me every time, the hotel’s closure last year made my heart weep”. “Closer to home and personal experience, at the Great Eastern Hotel in London we partnered with the Whitechapel Art Gallery to curate the art that hung in the lobby, while Franko B’s three and a half metre long neon sign above the front desk, ‘You make my heart go boom boom’, would lift the spirits of the weariest traveller”. Lydia, of Dais Contemporary who procure, commission and curate contemporary art for corporate, private and public spaces, including hotels, concludes: “Hotel owners are now realising that the artwork they purchase for their properties is as big a statement about their brand as any other interior choice for their properties”. 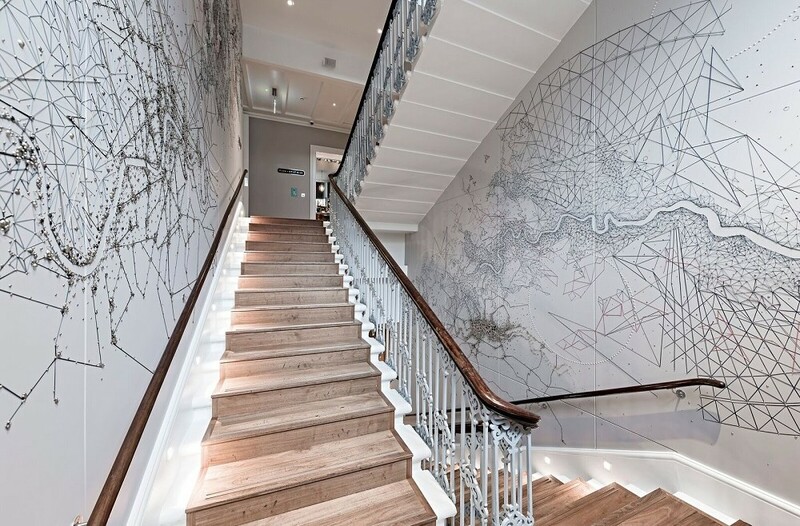 ‘A Tying of Knots’, a stunning new bespoke art installation by artist Debbie Smyth, which wraps around the staircase walls leading up to the restaurant, Plum and Spilt Milk, at The Great Northern Hotel in King’s Cross – the world’s first great railway hotel and now one of the finest luxury boutique hotels in London – is now complete. The installation is the latest success in the close relationship between art consultants ARTIQ and the hotel’s Owner-Operator Jeremy Robson, involving the orchestration of spectacular and integrated art installations for the ground and first floor public spaces, as well as key stairwells, corridors and lift lobbies. The relationship has ensured that the hotel and its profound commitment to art has become a stand-out example of intelligent and inspired vision and curation. ‘A Tying of Knots’ is a site-specific sewn piece that portrays a city in transition; referencing everything from Ordnance Survey maps from bygone years and heat maps charting interaction in the age of the internet to the unspoken conversations and bumping bodies of strangers along the local waterways and winding streets, plus the hustle of intersections and stations. 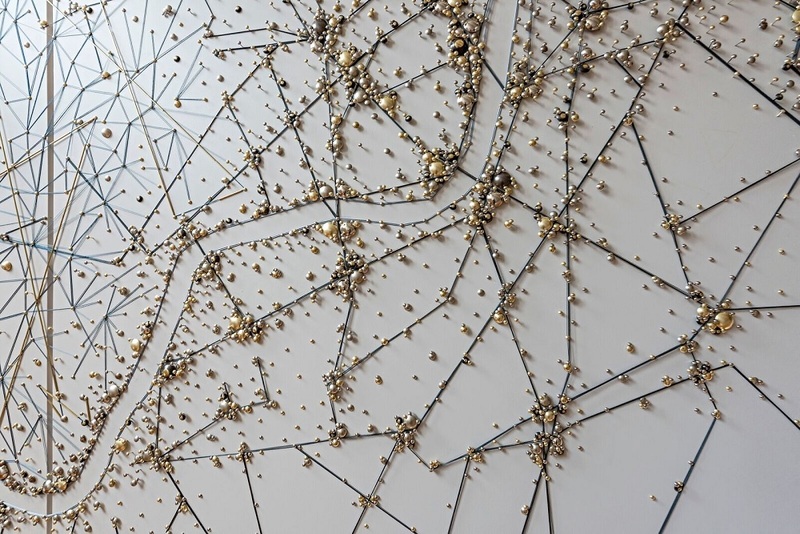 As a textile artist, Debbie Smyth is most identifiable by her statement thread drawings: playful yet sophisticated contemporary artworks created by stretching a network of threads between accurately plotted pins. Her work beautifully blurs the boundaries between fine art drawings and textile art, flat and 3D work, illustration and embroidery, literally lifting the drawn line off the page in a series of “pin and thread” drawings. As a fittingly poetic end to the project, the artist celebrated her own engagement whilst staying at The Great Northern Hotel – the transition to ‘tying the knot’ in her own life. Located in the heart of Ghana’s thriving cultural scene is a brand new five star luxury hotel, Kempinski Hotel Gold Coast City, Accra. The vibrant property features 269 rooms, including 22 suites and 2 stunning presidential suites. Art is a key focus for the property and this is reflected in the unique pieces located throughout the hotel and in the independent contemporary art gallery located inside the hotel known as Gallery 1957. 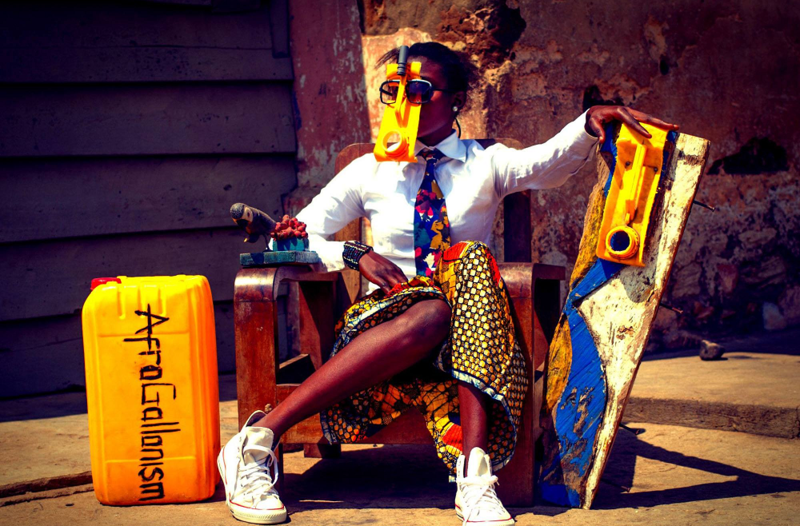 Taking its name from the year Ghana gained independence; the gallery represents artists such as Jeremiah Quarshie, Yaw Owusu, Serge Attukwei Clottey and Zohra Opoku. Featured in the hotel’s collection are also outstanding pieces by Agosor, Ni Mills, Krotei Tetteh, Gideon Appah and Ablade Glover. Kempinski Hotel Gold Coast City Accra encourages both local audiences and international visitors to discover new artists and to gain a deeper understanding of the breadth of their practices through the hotel installations and exhibitions at the gallery. With a range of exquisite dining options and a new spa to open in November, the property lives up to its name as the only true 5* hotel in Accra. 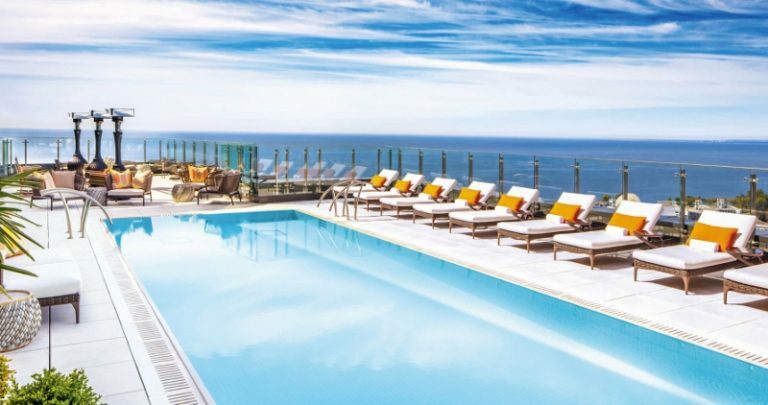 As a private & exclusive luxury hotel in Bantry Bay, Ellerman House is one of Cape Town’s finest accommodations for the discerning traveller. 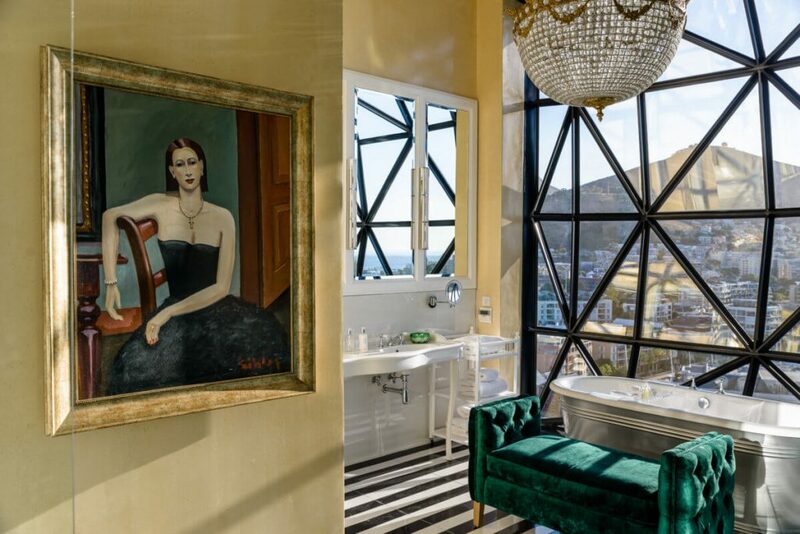 With Cape Town being one of the world’s top destinations and known for fast growing design and art, the development of The Studio was a natural progression for Ellerman House. The aim was to create a space on the property where guests will be able to purchase high-end products that are unique to South Africa. Guests will have access to a uniquely curated collection of creative products and art such as diamonds by Benguela, bags by Missibaba, jewellery by Pichulik and many more loved local designers, manufacturers and artists. The products that form part of The Collection are seasonally refreshed and will ensure that only the best and most up to date products are available to the luxury travel market at Ellerman House. Some of the designers and brands the hotel has partnered with include De Wieff, Mungo and Julie de Pao.